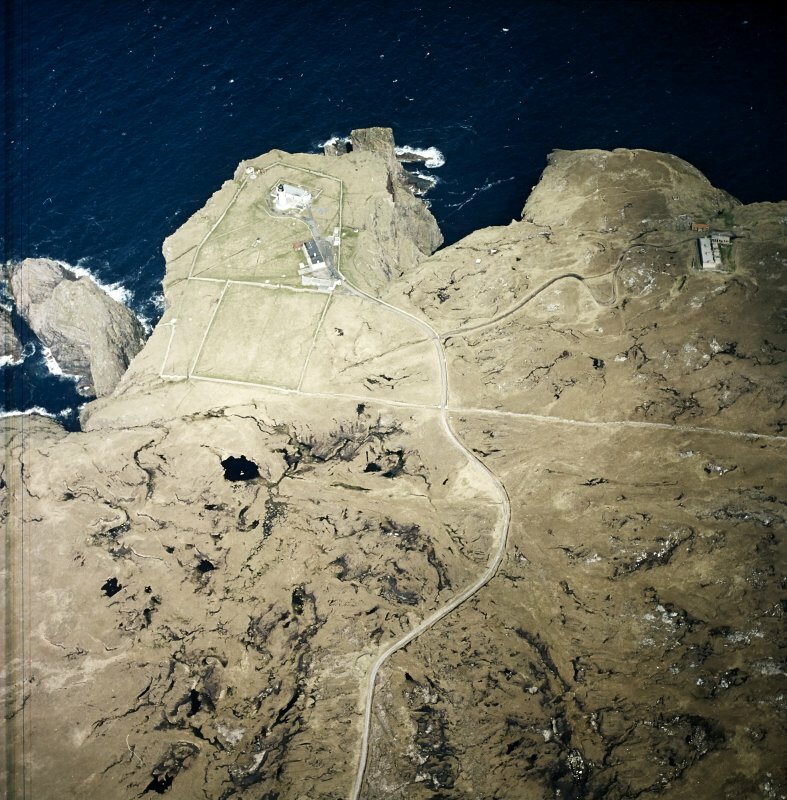 Oblique aerial view centred on the lighthouse, keepers' cottages, cottages and support buildings with the radar station adjacent, taken from the NNW. 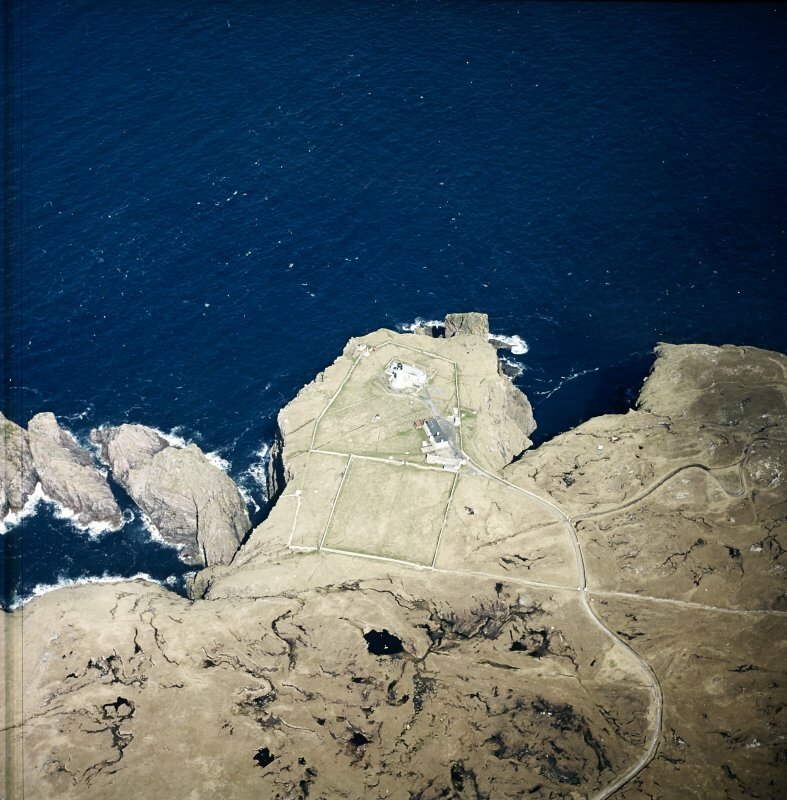 Oblique aerial view centred on the lighthouse, keepers' cottages, cottages and support buildings, taken from the NE. 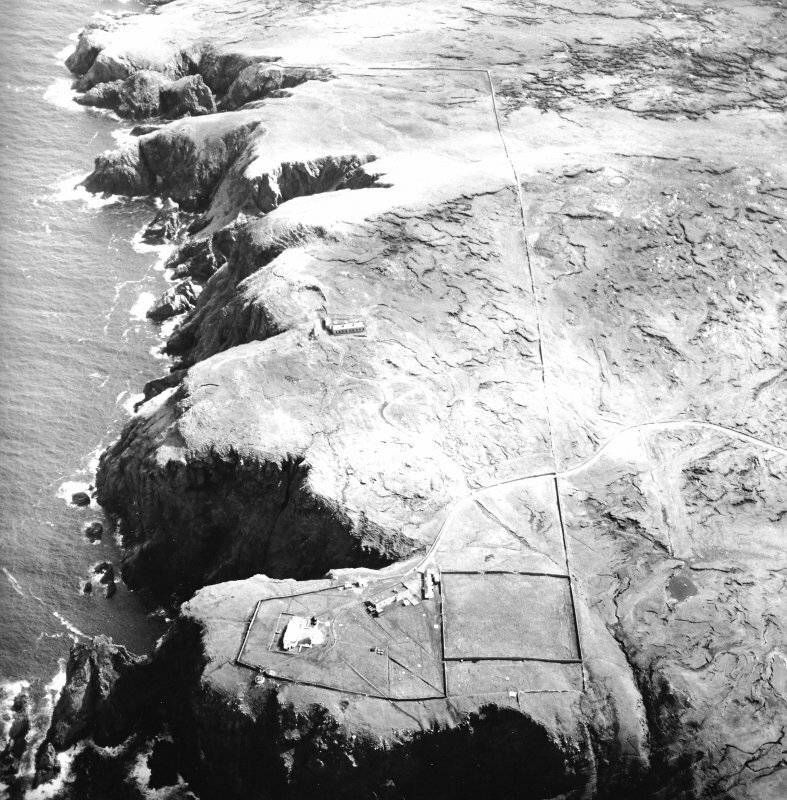 Oblique aerial view centred on the lighthouse, keepers' cottages, cottages and support buildings with the radar station adjacent, taken from the SW.
General view of site from ESE. 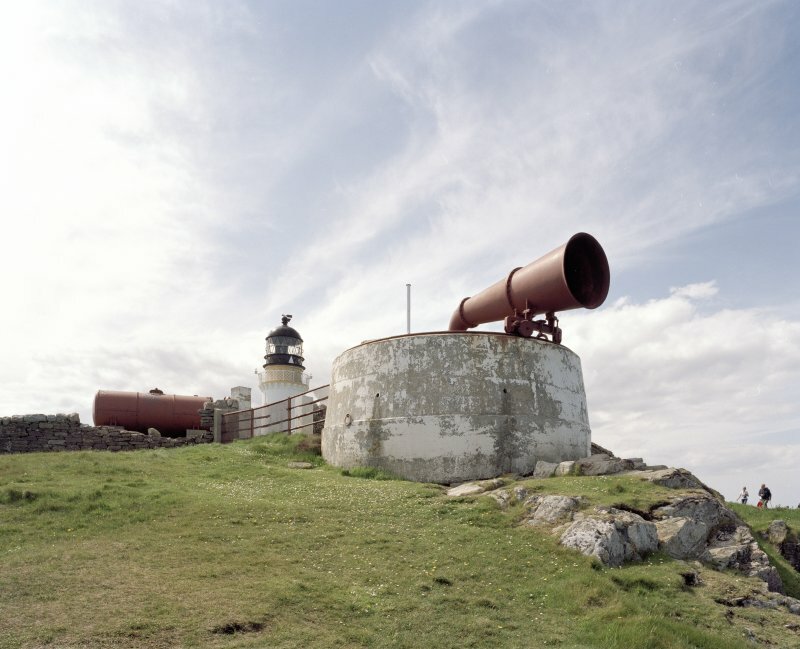 View of foghorn from NNE. 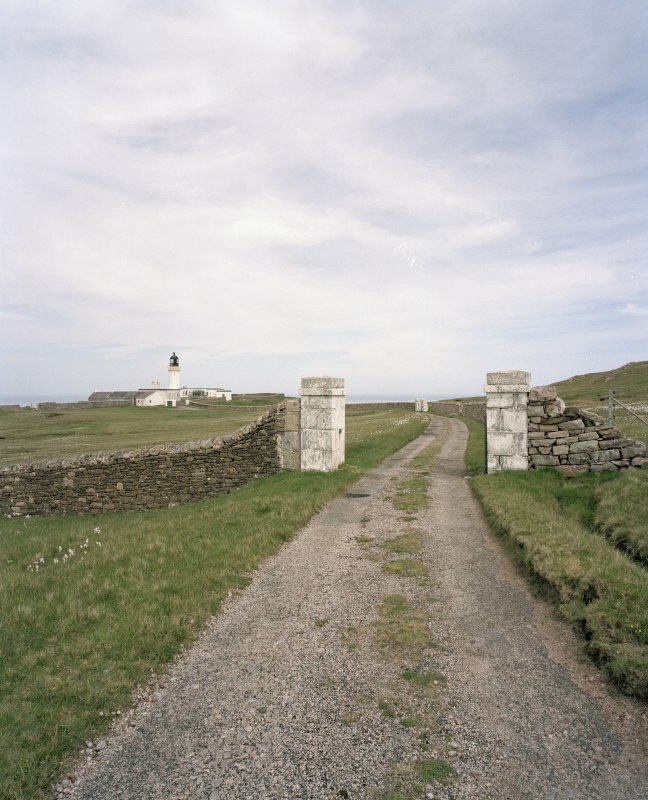 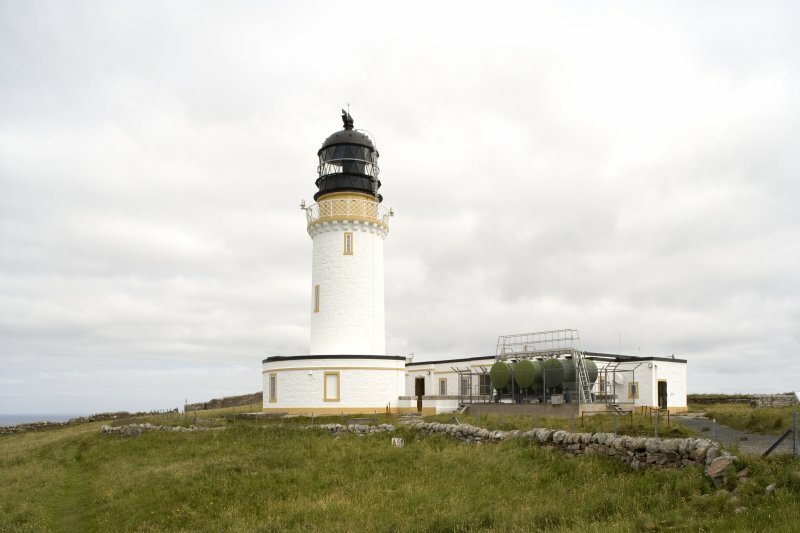 View of the Cape Wrath lighthouse (NC27SE 3.00) from the south-east. 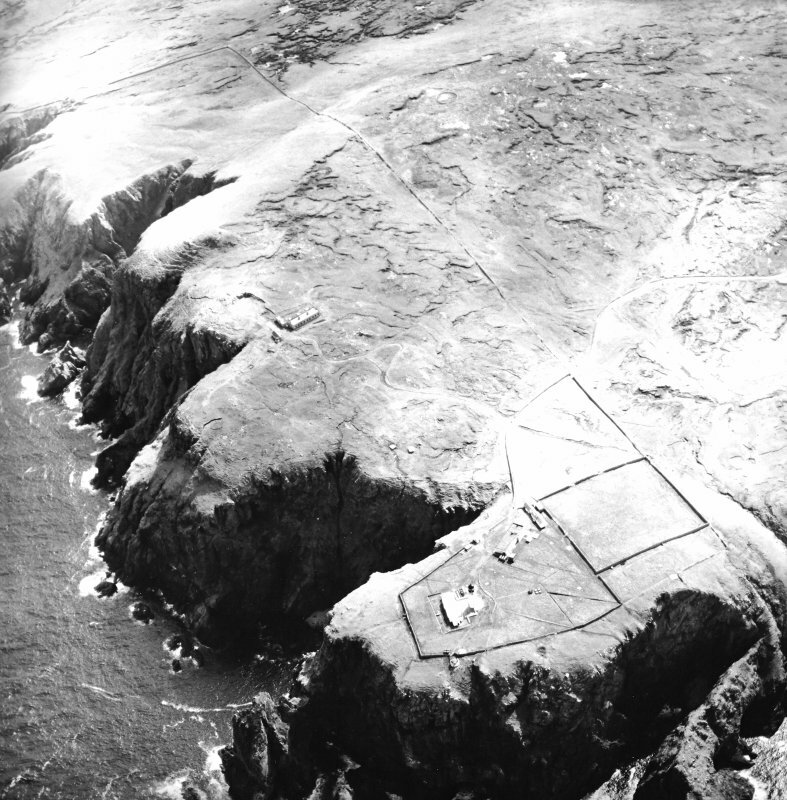 Oblique aerial view centred on the lighthouse, keepers' cottages, cottages and support buildings with the radar station adjacent, taken from the NE. 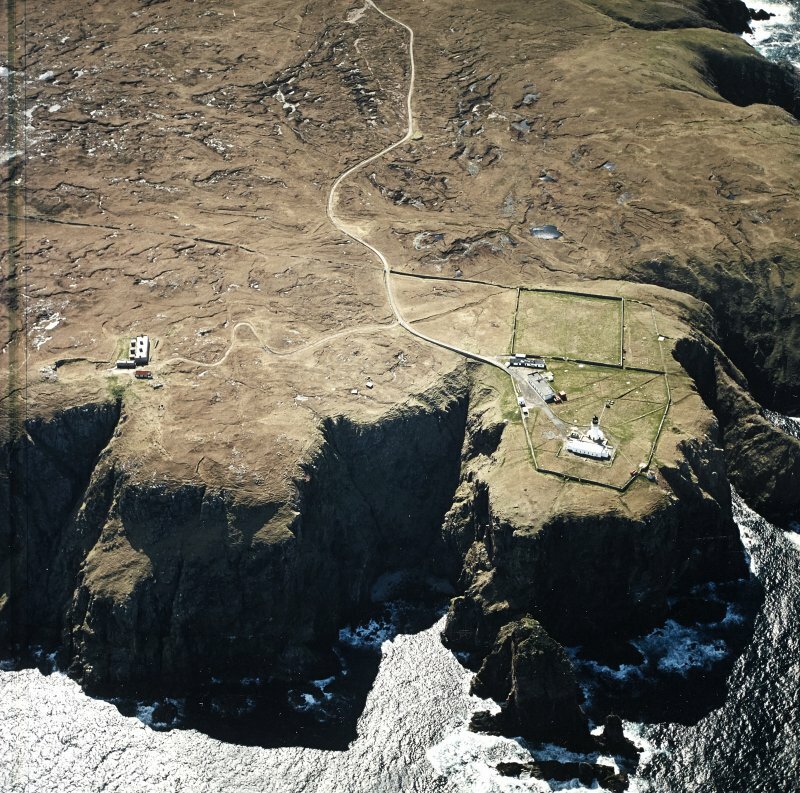 Oblique aerial view centred on the lighthouse, keepers' cottages, cottages and support buildings with the radar station adjacent, taken from the E.
Oblique aerial view centred on the lighthouse, keepers' cottages, cottages and support buildings with the radar station adjacent, taken from the ESE. 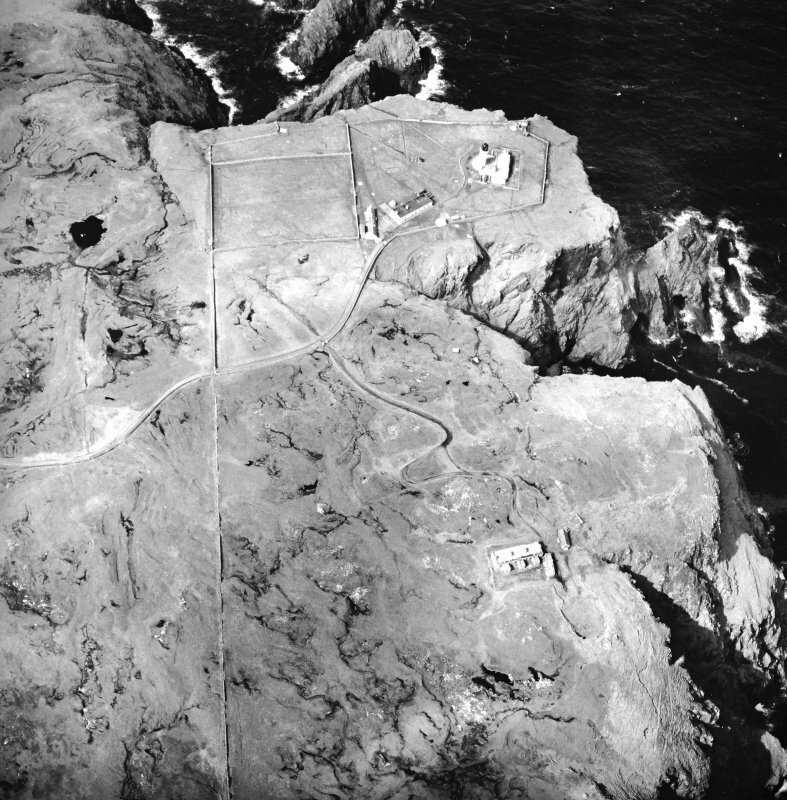 Oblique aerial view centred on the lighthouse, keepers' cottages, cottages and support buildings with the radar station adjacent, taken from the S.
View of foghorn from W.
View of cottages and support buildings from SE. 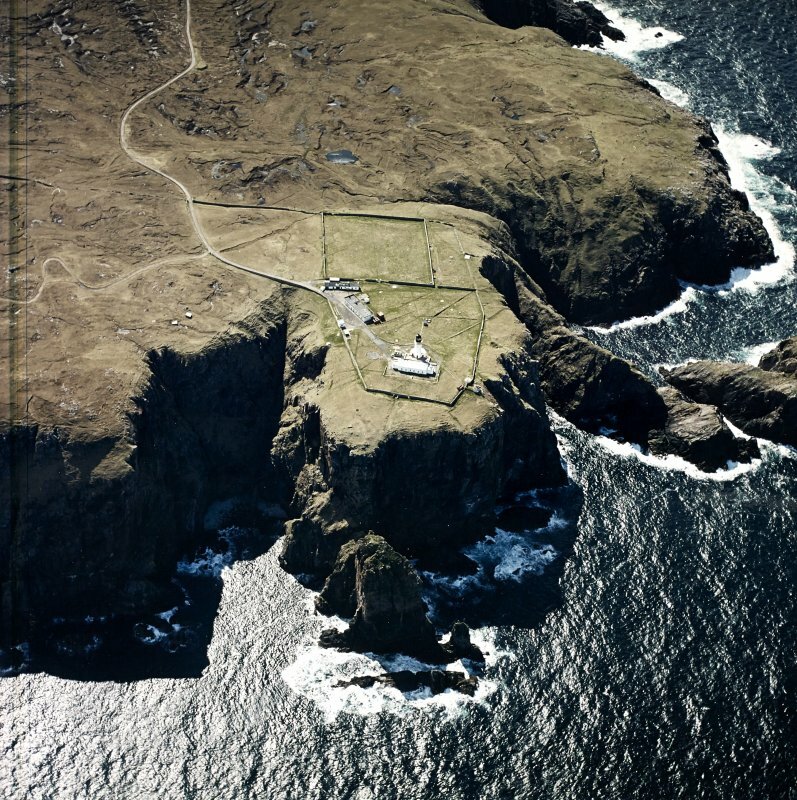 Oblique aerial view centred on Cape Wrath lighthouse, looking SE. 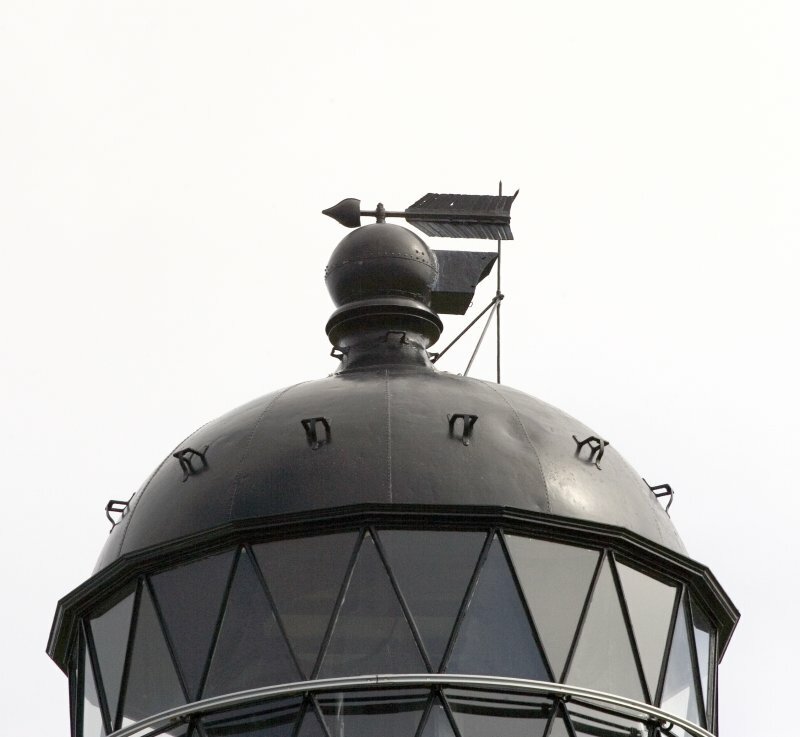 Detail of the top of the lighthouse tower. 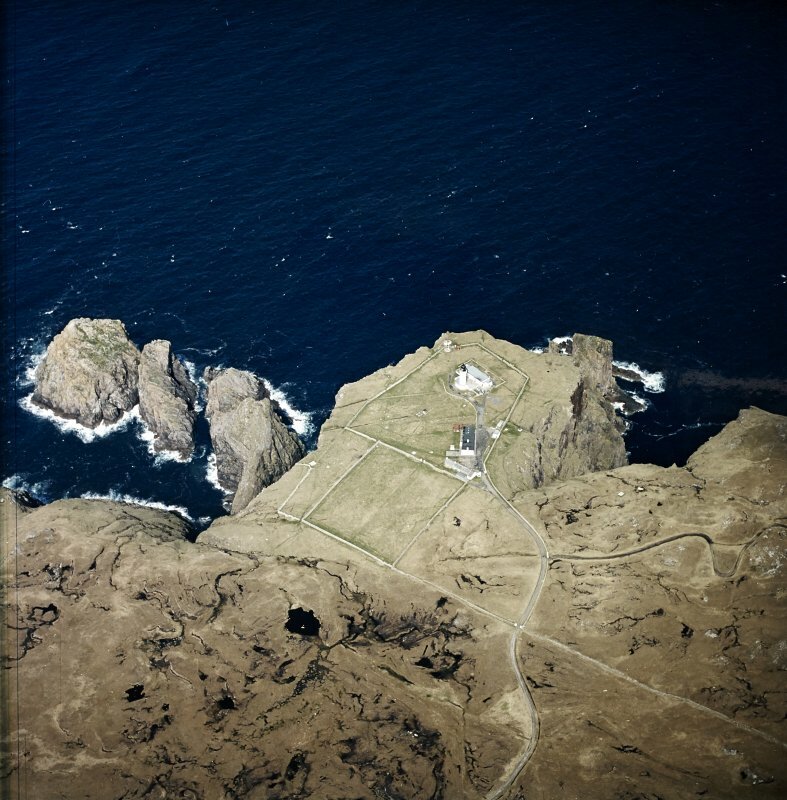 Oblique aerial view centred on the lighthouse, keepers' cottages, cottages and support buildings with the radar station adjacent, taken from the NW. 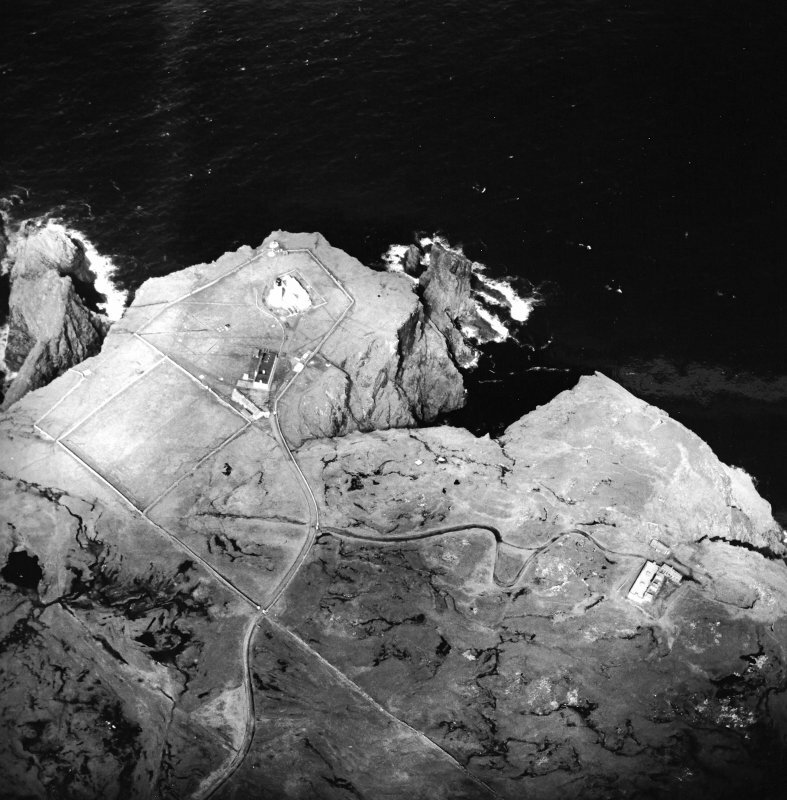 View of lighthouse and cliffs from E.
View of cottages and support buildings from NE. 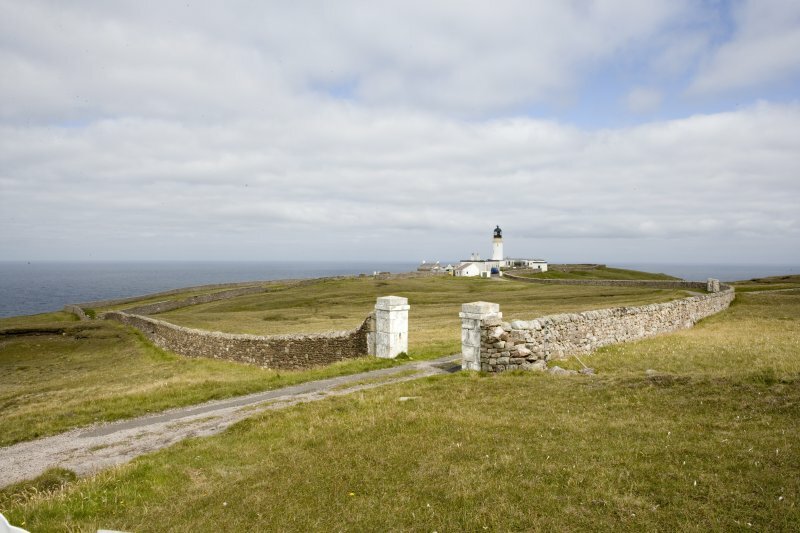 View from the E of the lighthouse keepers' cottages and lighthouse tower. 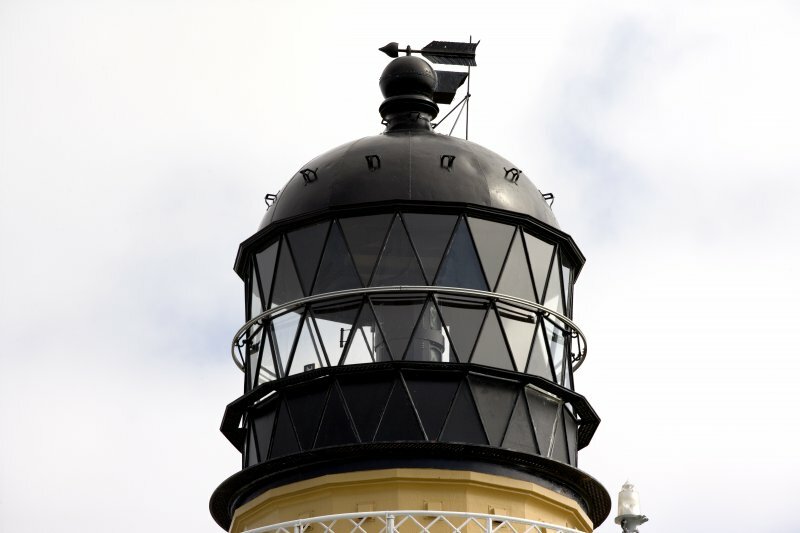 View from ENE of the foot of the lighthouse tower. 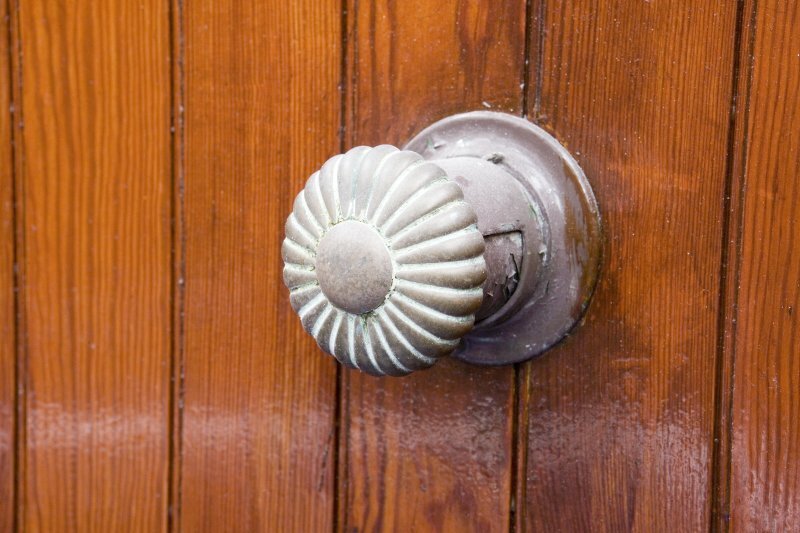 Detail of handle on door of wood-panelled cupboard in lighthouse tower. 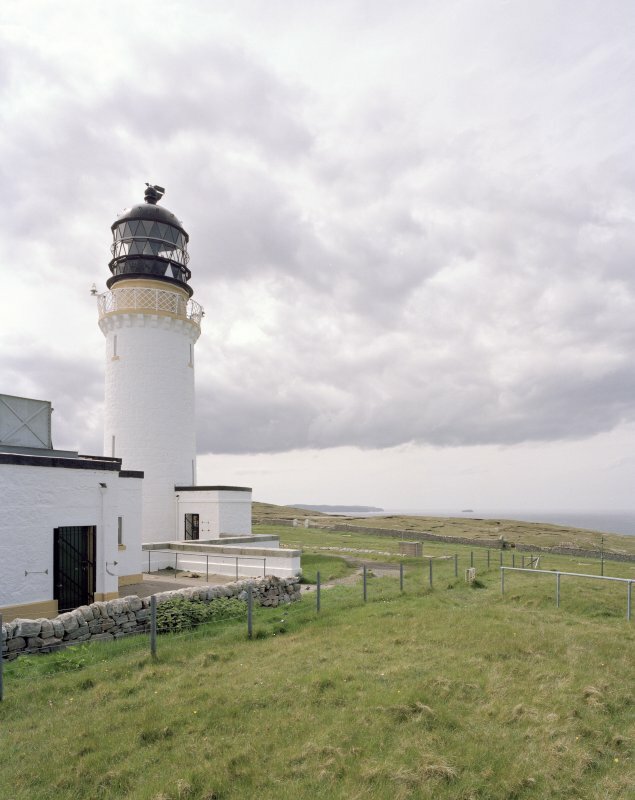 View from south-east of the Cape Wrath lighthouse. 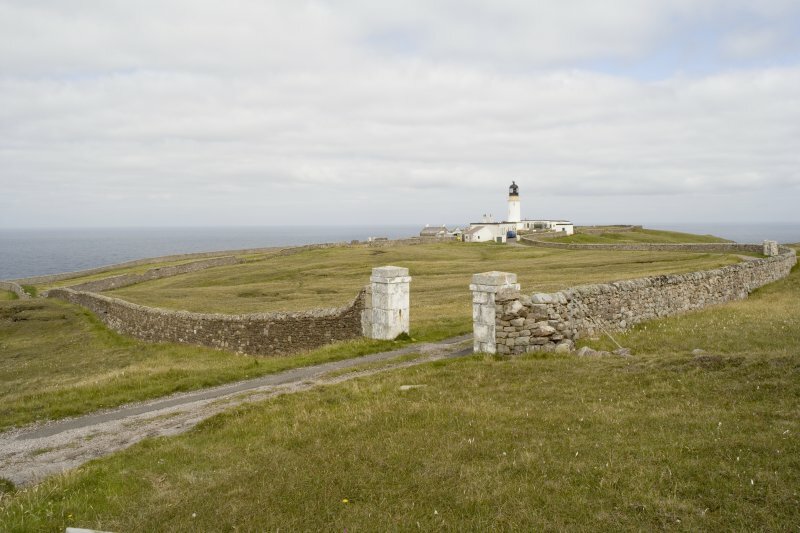 View from SW of the lighthouse and the lighthouse keepers' cottages. 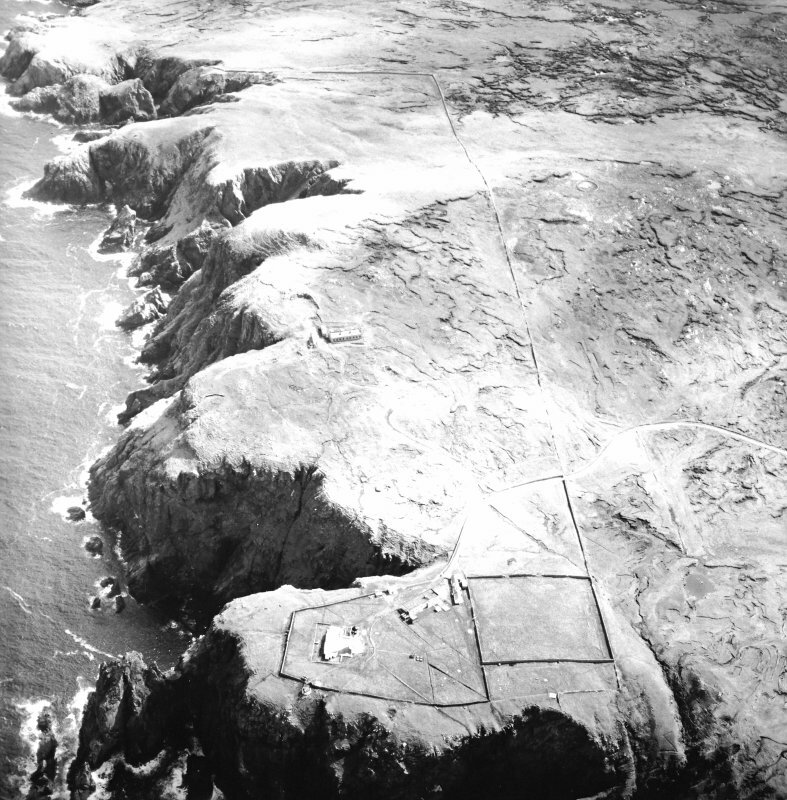 Oblique aerial view centred on the lighthouse, keepers' cottages, cottages and support buildings, taken from the SW.
Oblique aerial view centred on the lighthouse, keepers' cottages, cottages and support buildings with the radar station adjacent, taken from the SE. 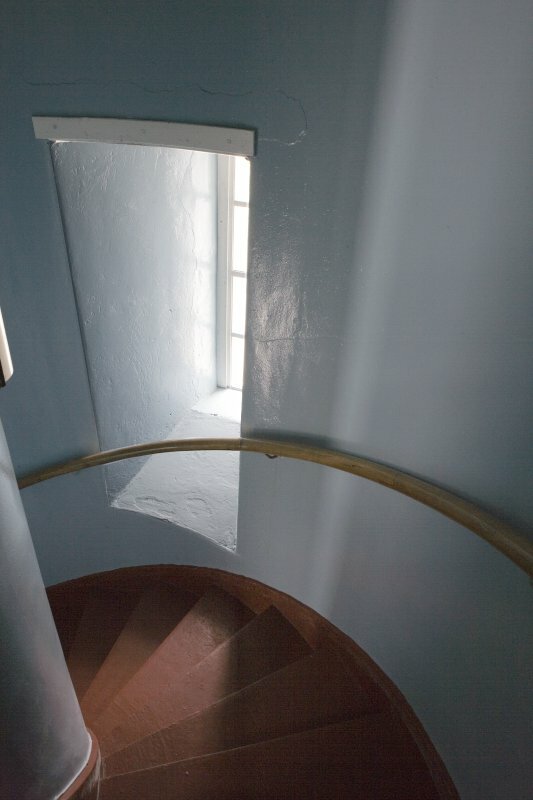 View from ENE of the lighthouse tower. 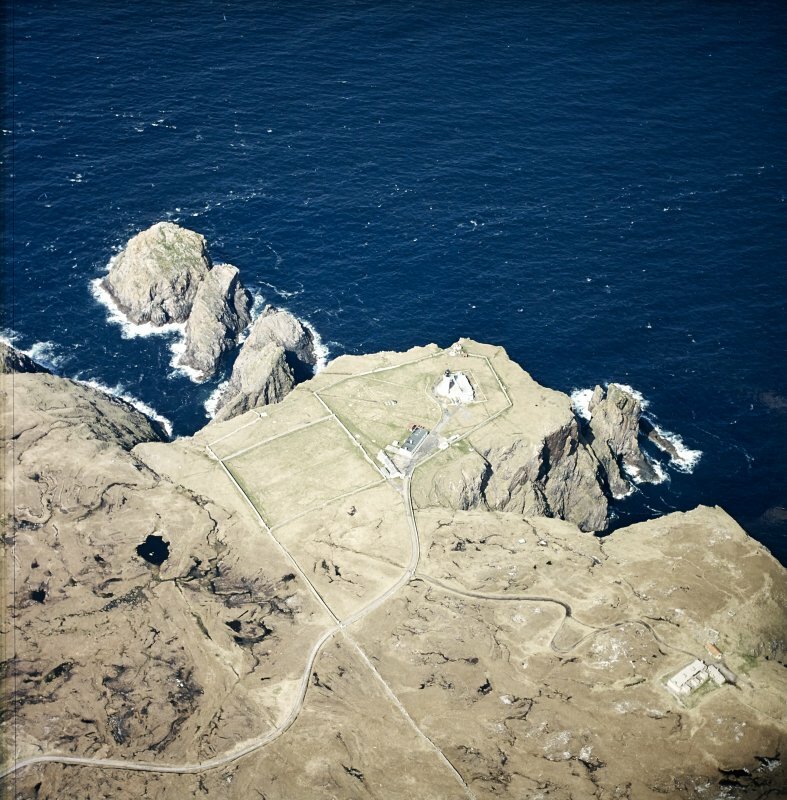 View from SSE of the lighthouse and the lighthouse keepers' cottages. 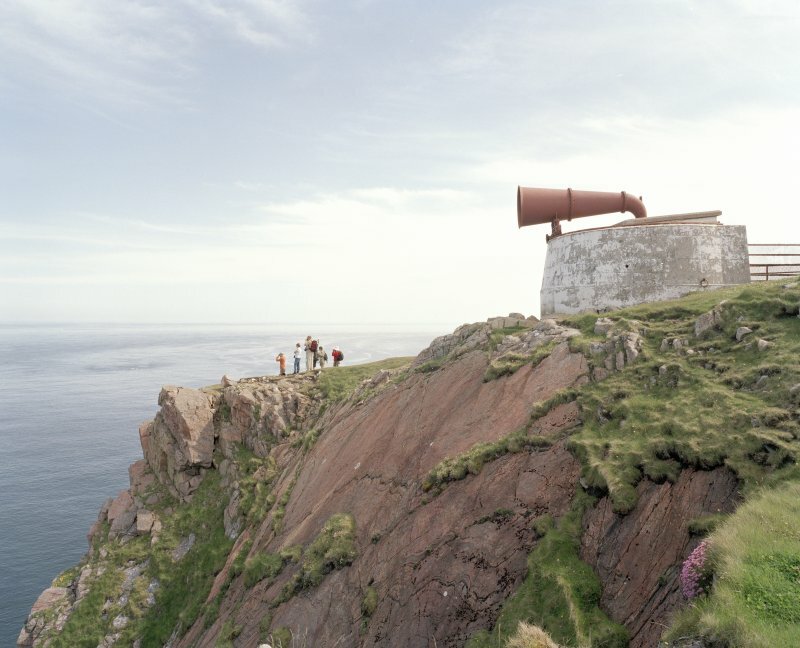 View of foghorn from WSW. 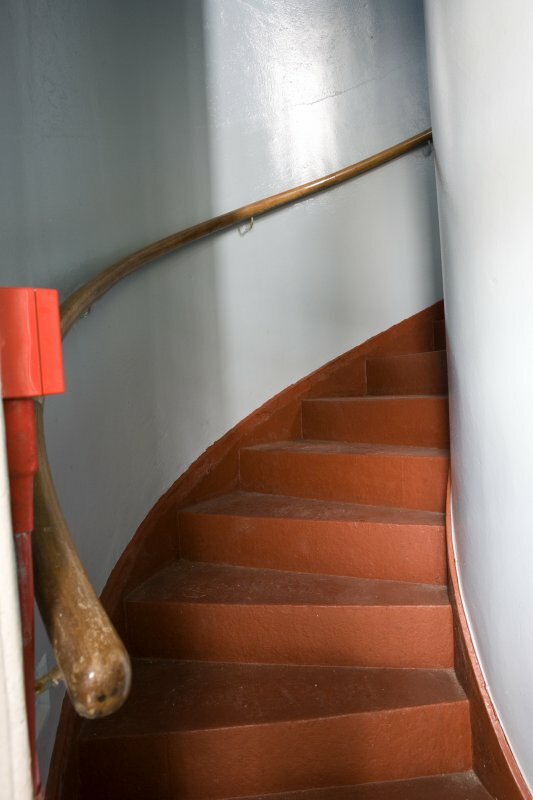 View within circular stair tower of lighthouse. 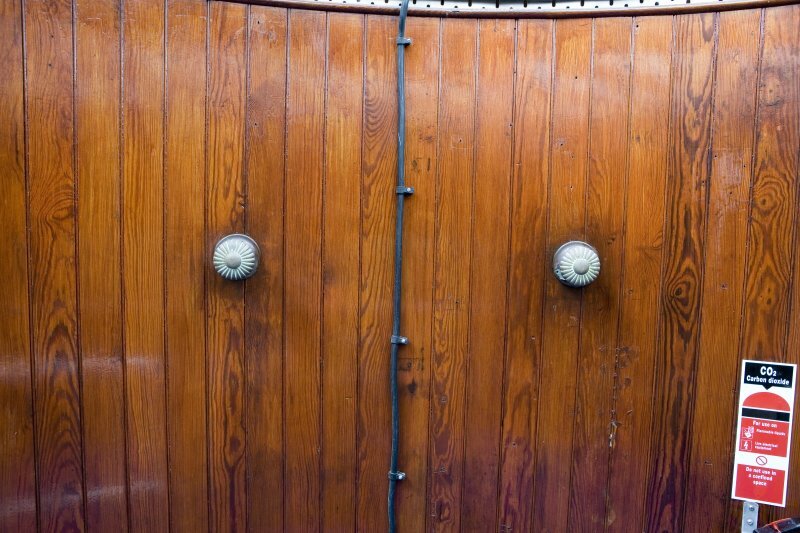 Detail of wood-panelled doors of cupboard in lighthouse tower. 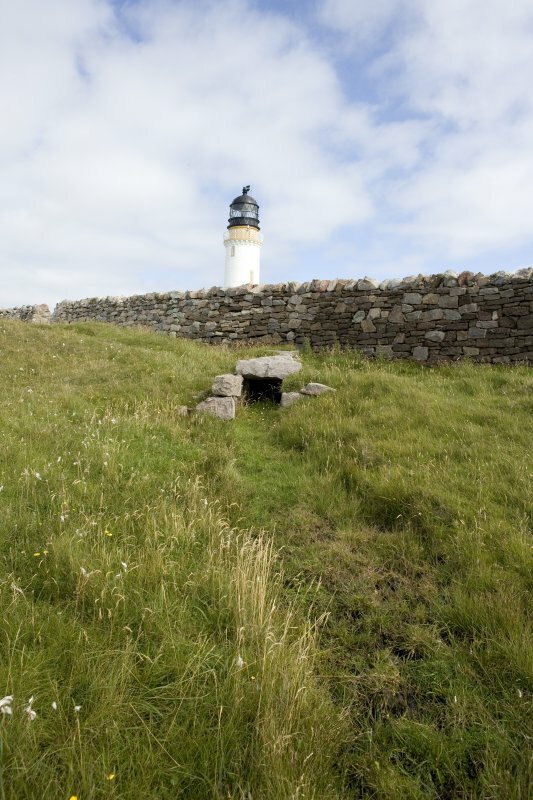 View of culvert beneath wall to the NW of the lighthouse. 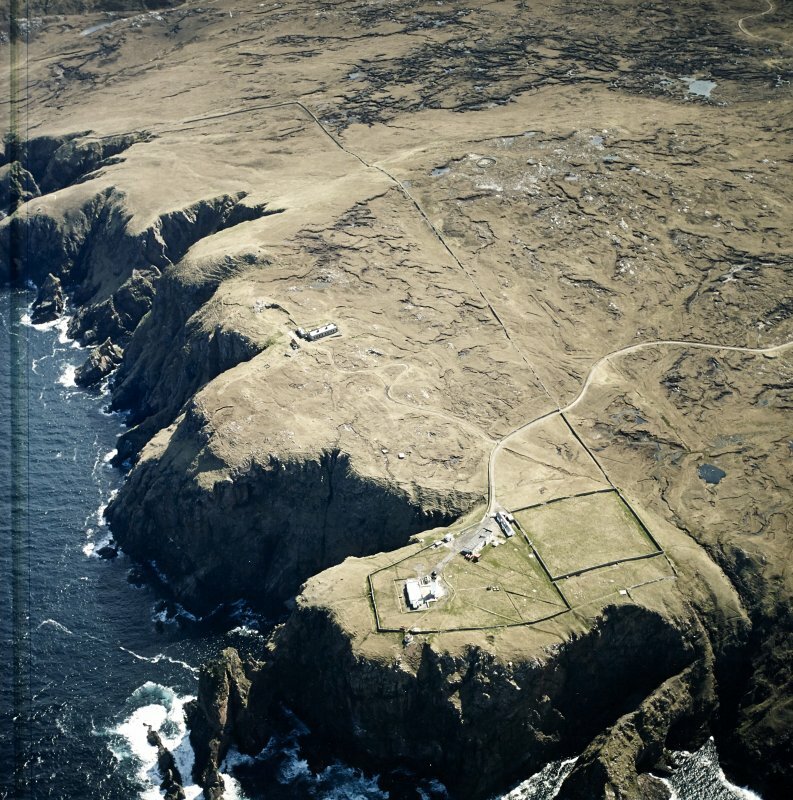 General oblique aerial view of the coast from Sandwood Bay to Cape Wrath, looking NNE. 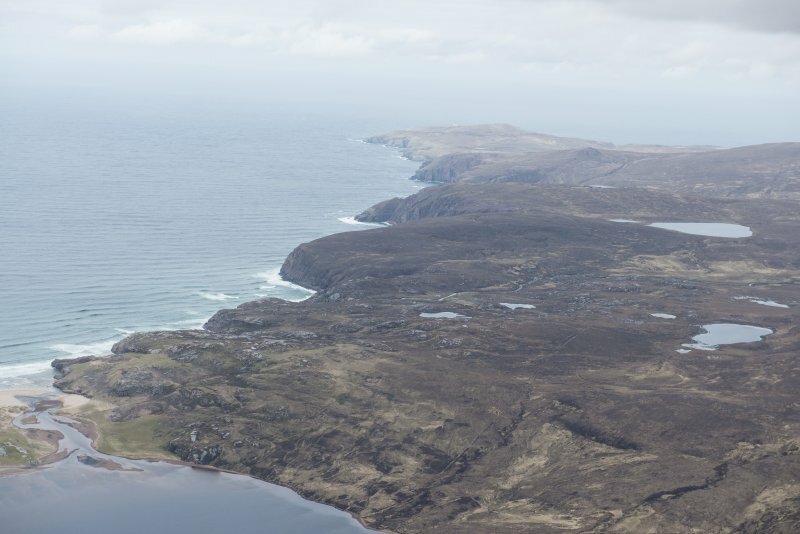 View of coastline to SE from NW. 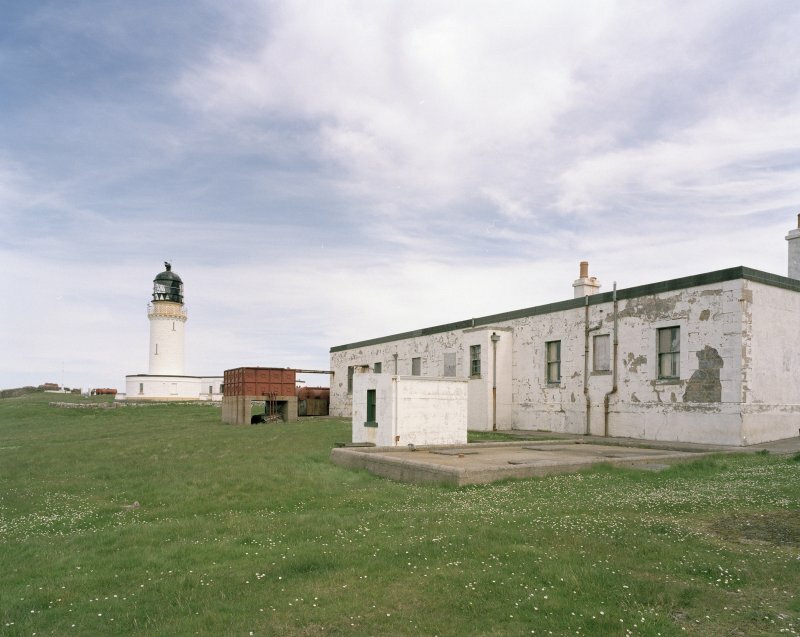 View from SW of the SE end of the Lighthouse keepers' cottages. 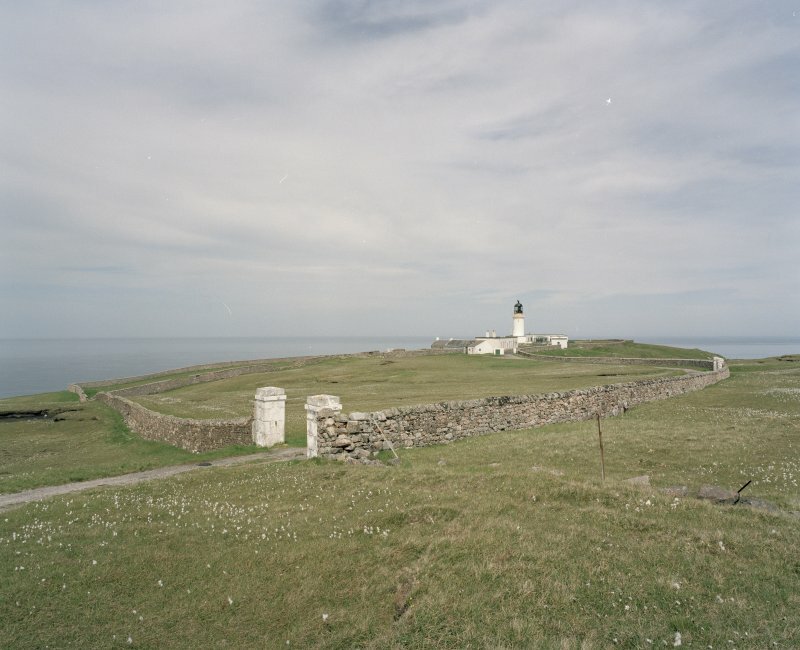 View of the Cape Wrath lighthouse (NC27SE 3.00) from the south, also showing the boundary wall (NC27SE 3.05; CWTC08 415), built in 1828. 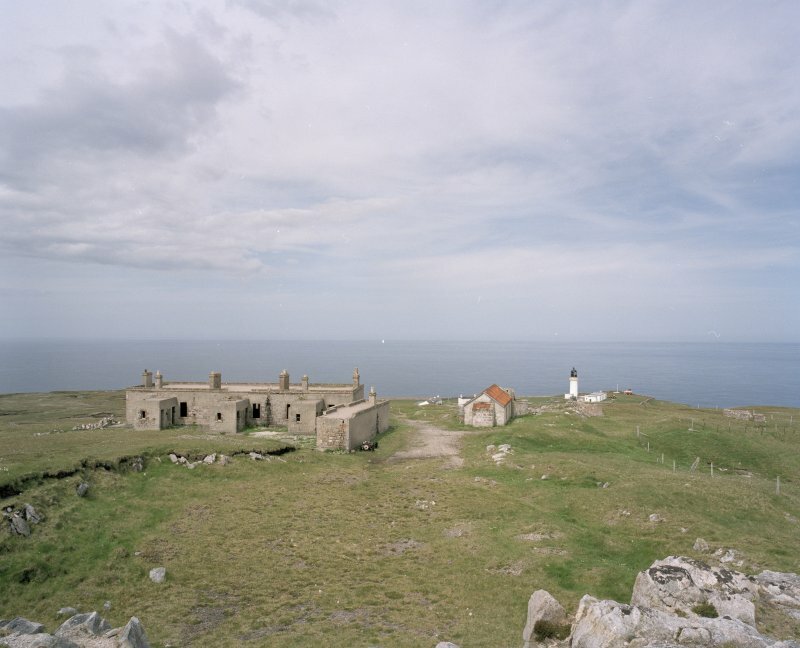 View from WNW of the lighthouse and terrace of cottages and stores. 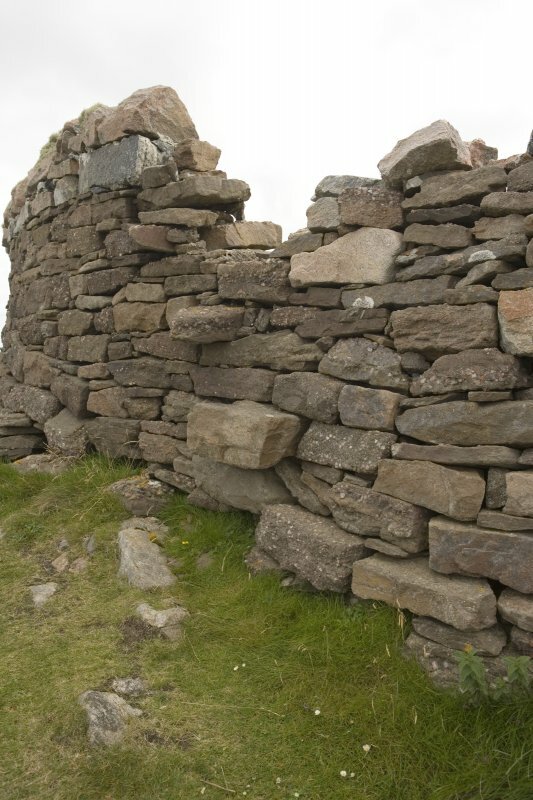 Detail of drystone wall close to the lighthouse. 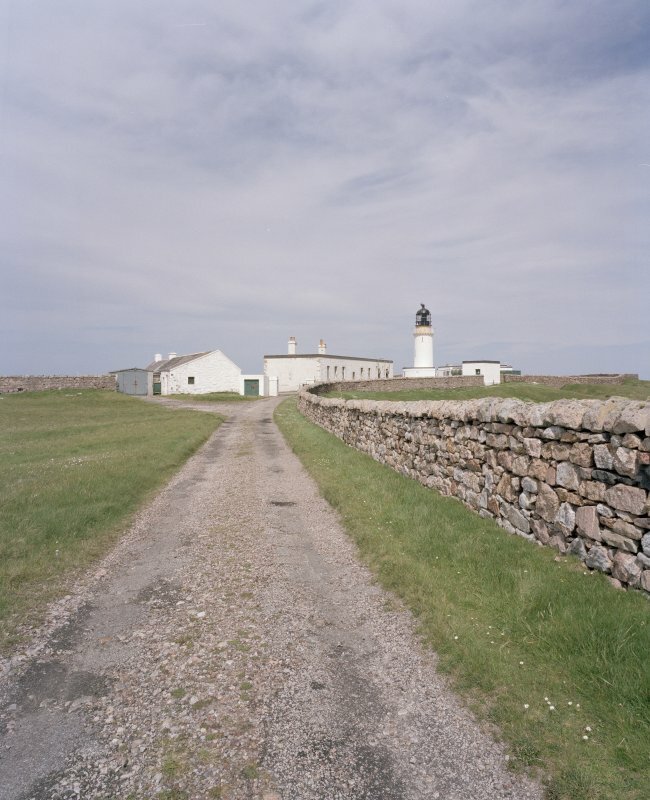 View from NNW of the lighthouse and the lighthouse keepers' cottages. 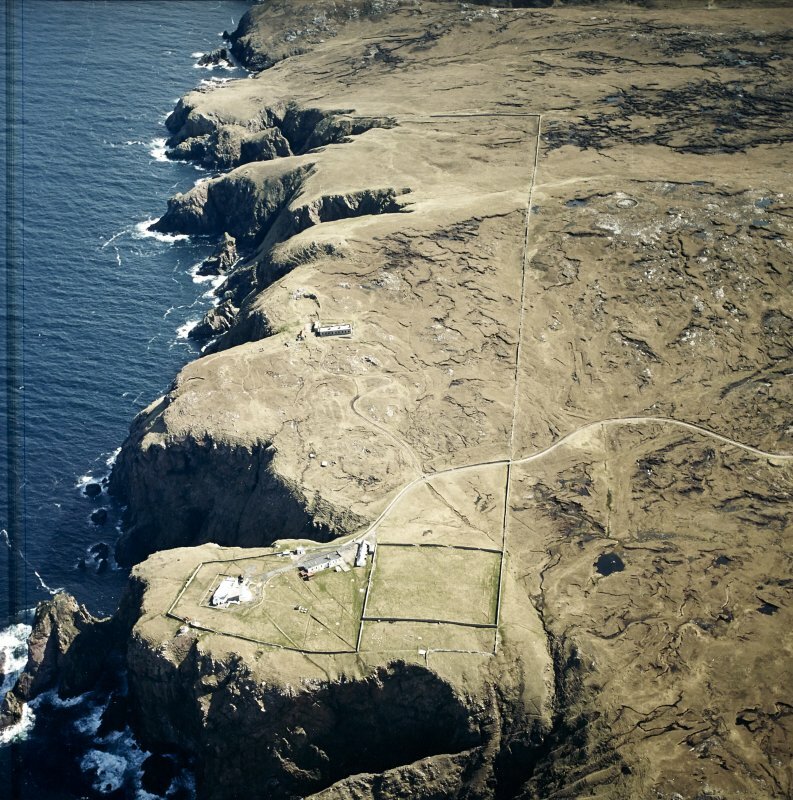 View from NWE of the lighthouse and the lighthouse keepers' cottages. 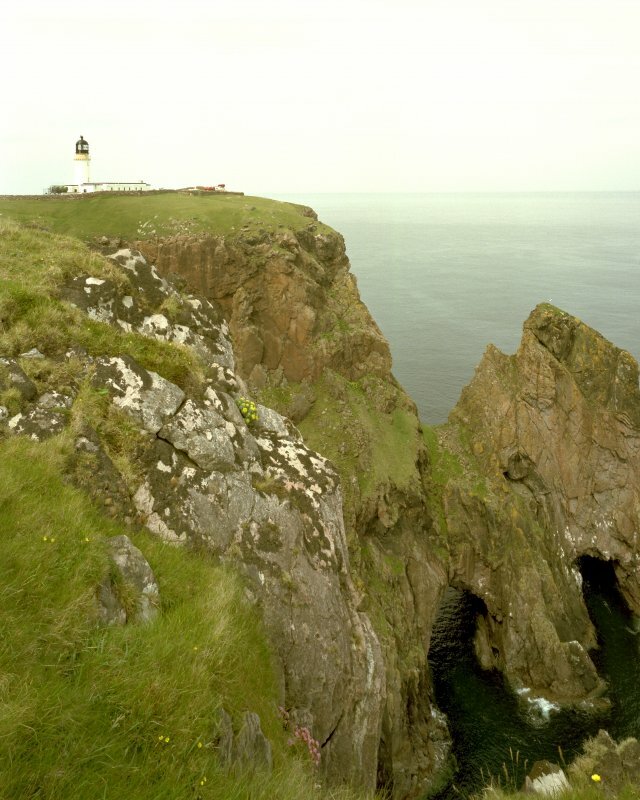 View from SW of the lighthouse. 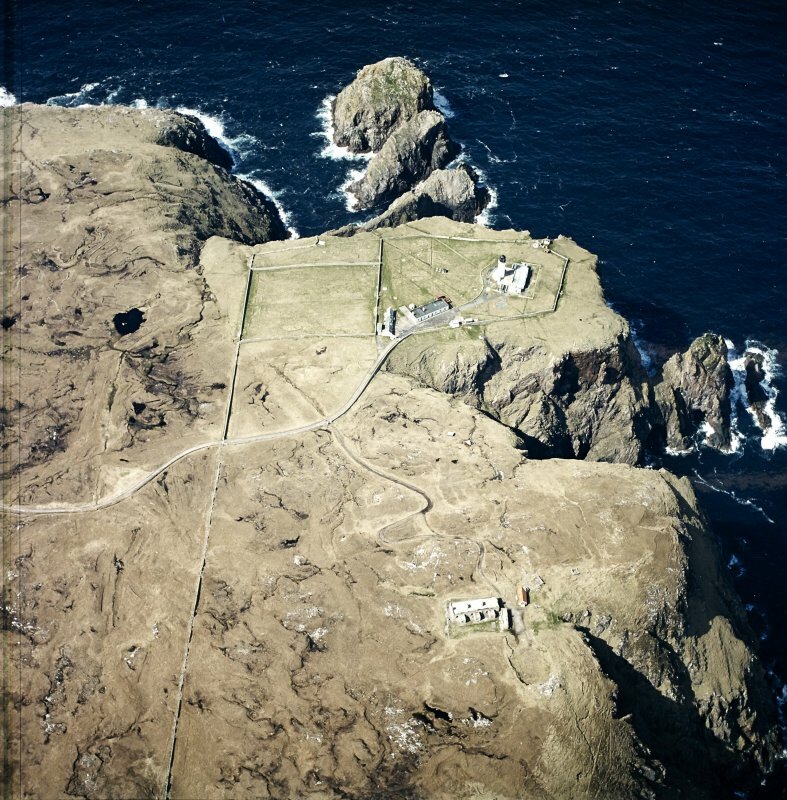 Oblique aerial view centred on the lighthouse, keepers' cottages, cottages and support buildings with the radar station adjacent, taken from the SSE. 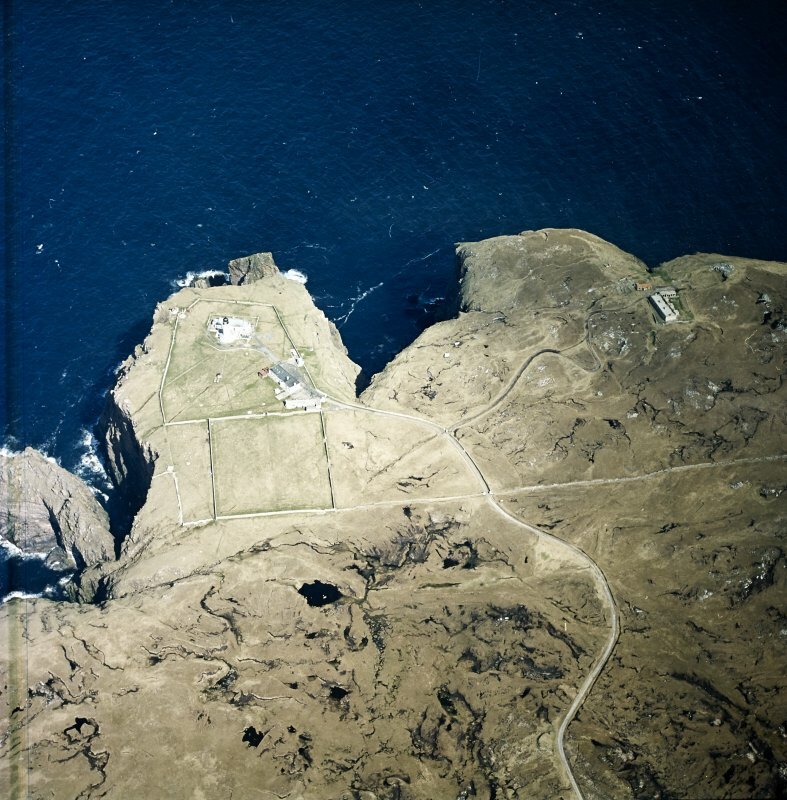 Oblique aerial view centred on the lighthouse, keepers' cottages, cottages and support buildings with the radar station adjacent, taken from the N.
Oblique aerial view centred on the lighthouse, keepers' cottages, cottages and support buildings, taken from the SSW. 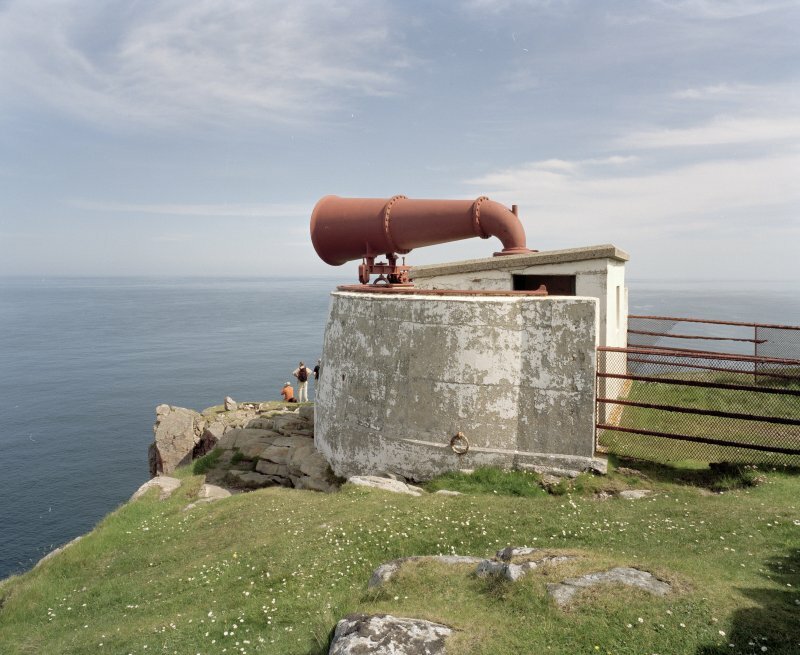 View of foghorn from ESE. 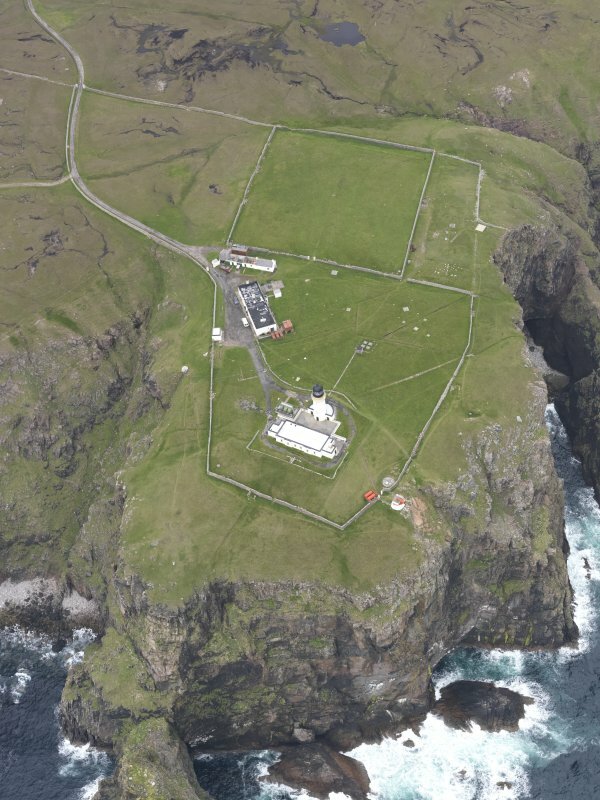 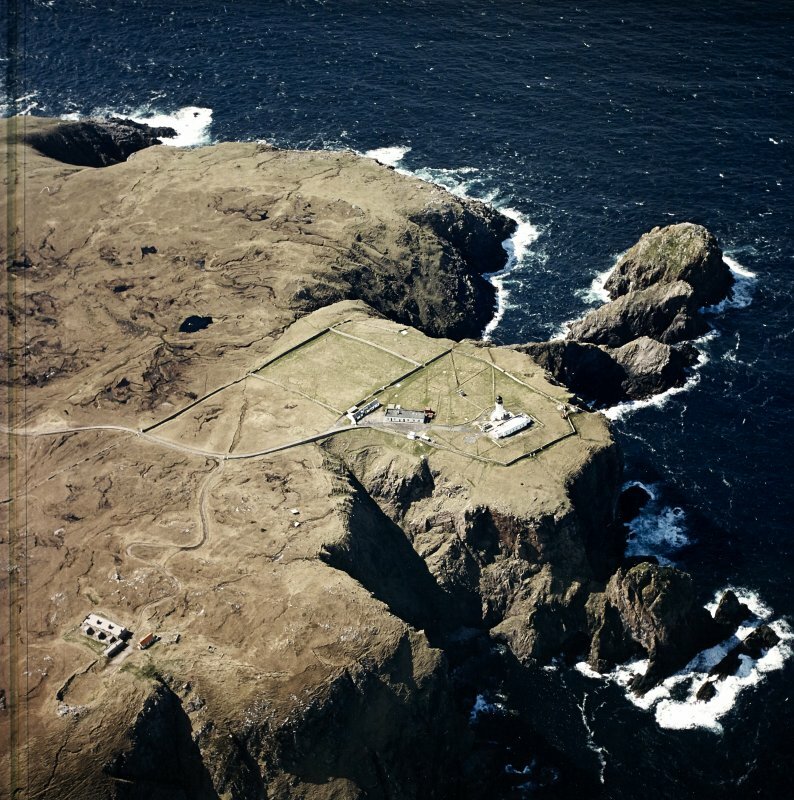 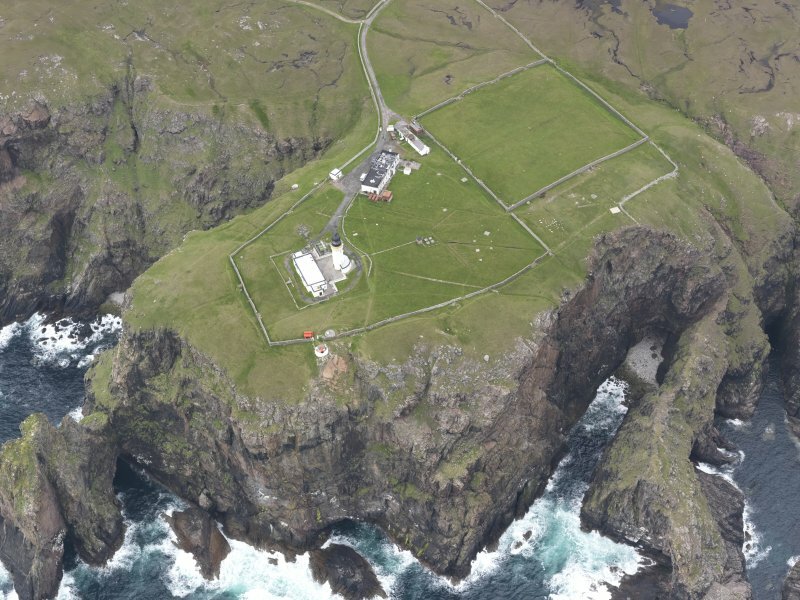 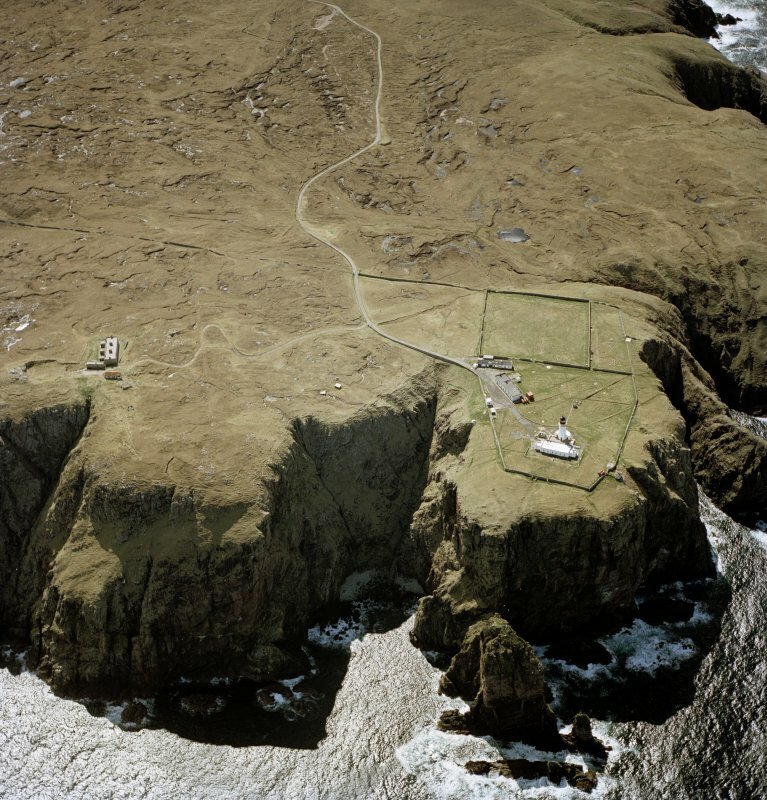 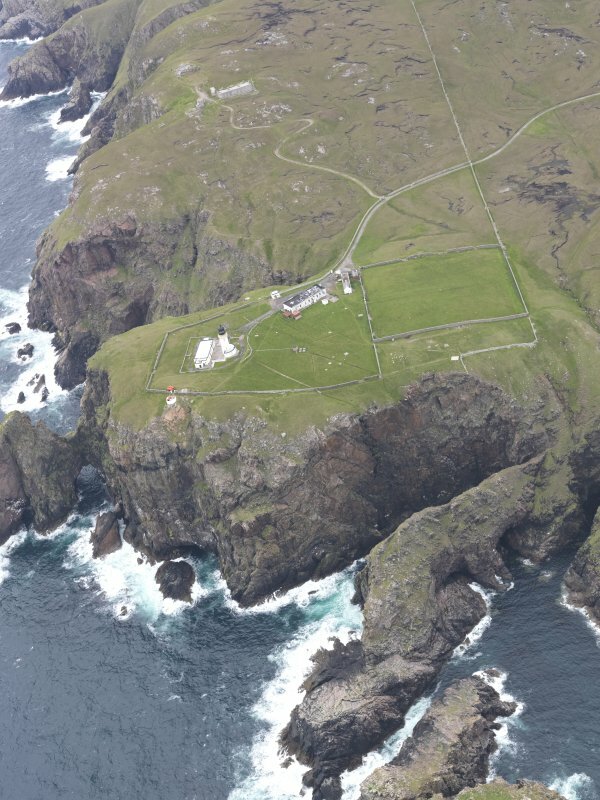 Oblique aerial view centred on Cape Wrath lighthouse, looking S.
View of Cape Wrath lighthouse from south-east. 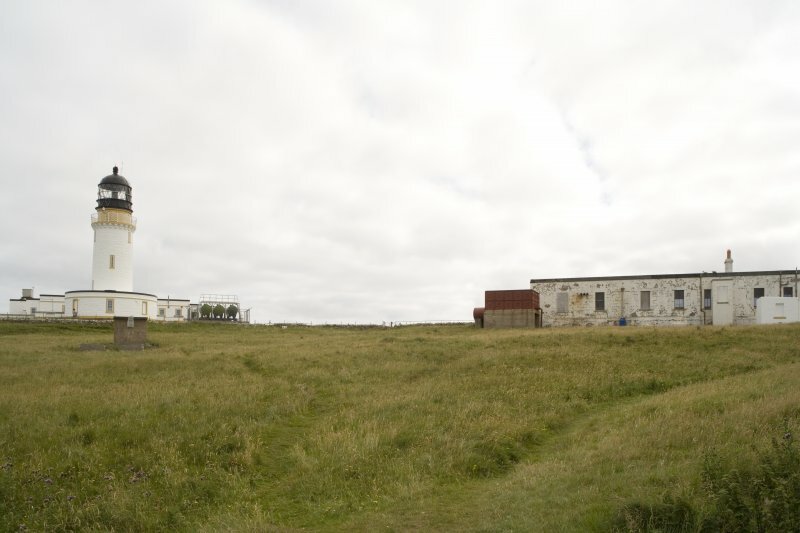 View from SSW of the lighthouse and the lighthouse keepers' cottages. 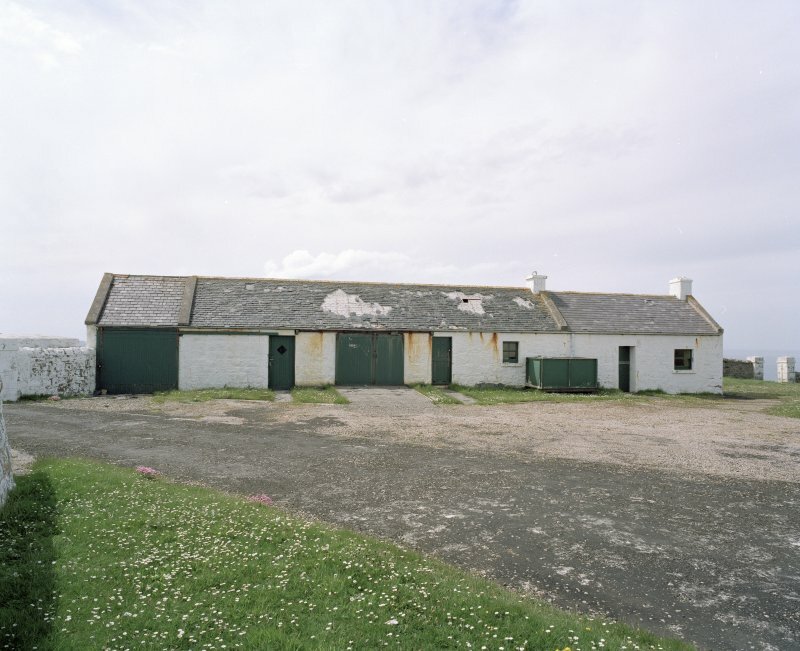 (Location cited as NC 259 747). 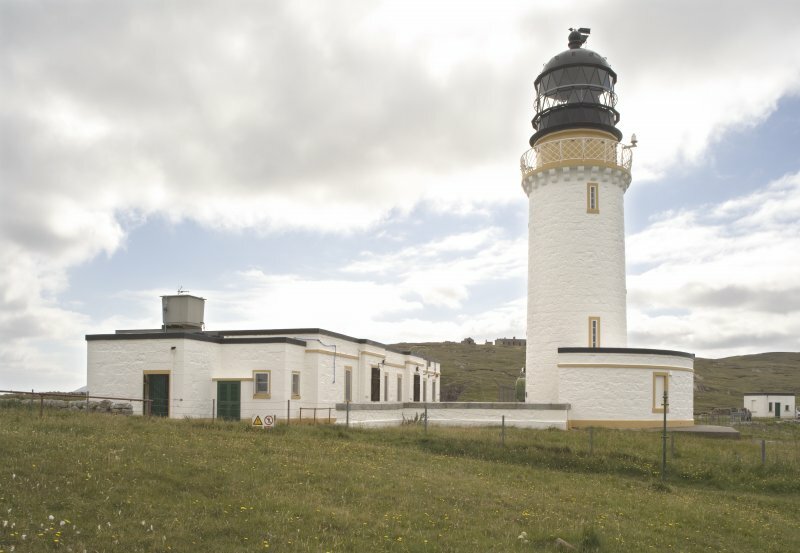 Cape Wrath Lighthouse: built 1827-8, engineer Robert Stevenson. 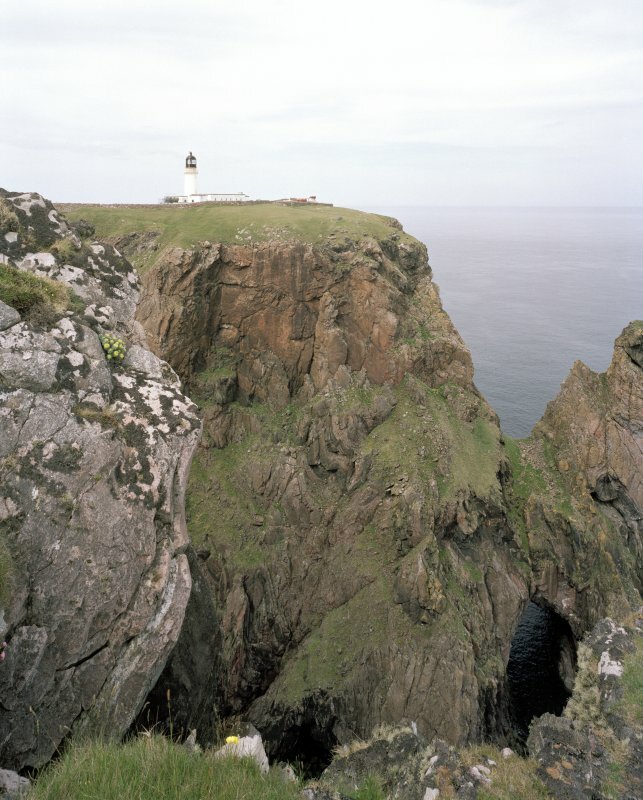 A short tower of local granite on a semi-circular base, with a corbelled parapet. 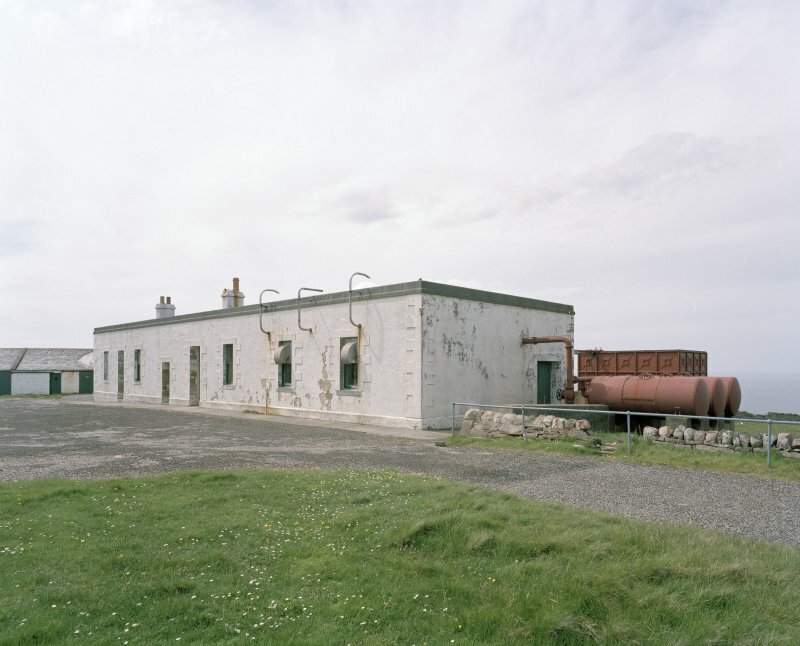 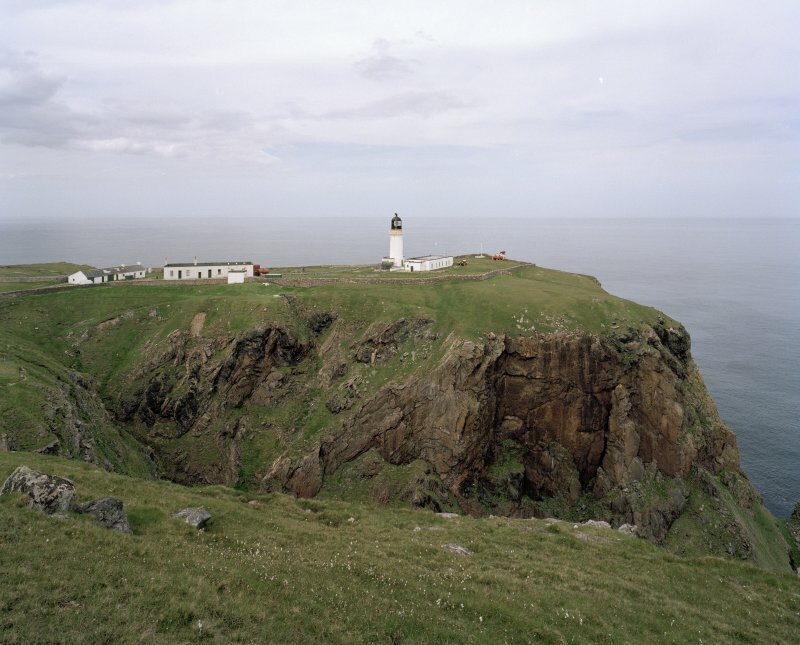 The Cape Wrath lighthouse was built at a cost of £14,000 with a reflector system which alternated a light of natural appearance with one tinged red. 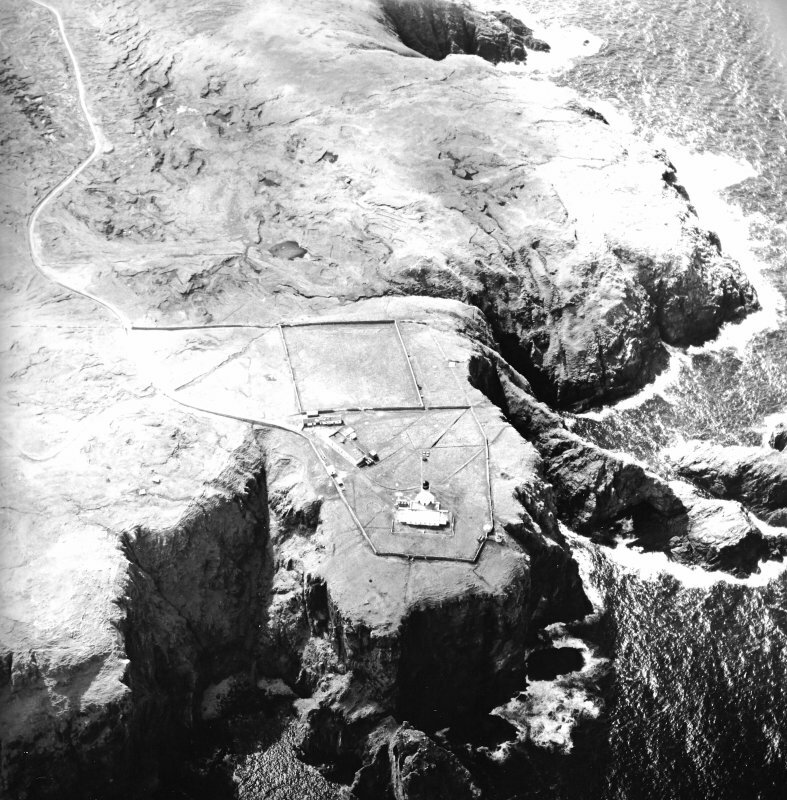 It was often obscured by fog of low cloud so that the construction of a new (low) light was begun; this involved the construction of a vertical shaft in the cliff to accommodate a lift, a covered way over the rocks with two connecting bridges, and a tower and foghorn house on the extreme end of the reef. 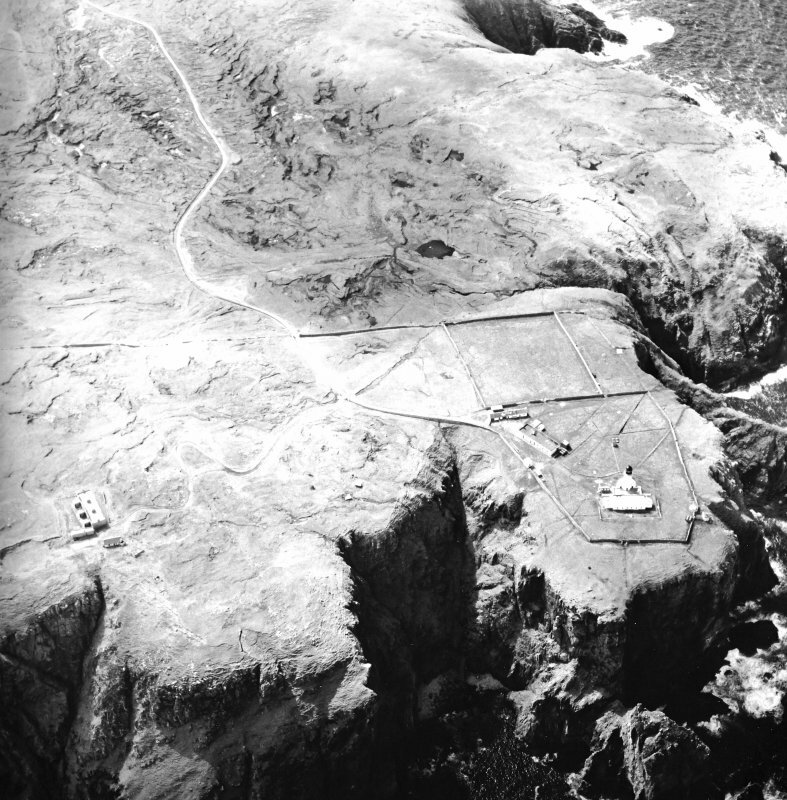 Blasting and quarrying had begun and the shaft sunk to a depth of 50ft (15.2m) in June 1914 when work stopped 'for the duration' in the face of a disagreement with the contractor; it was never restarted. 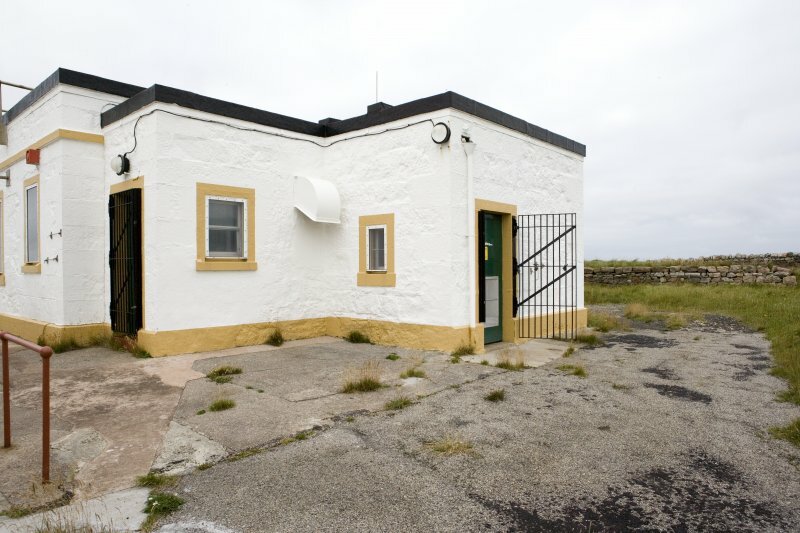 NC 25971 74741. 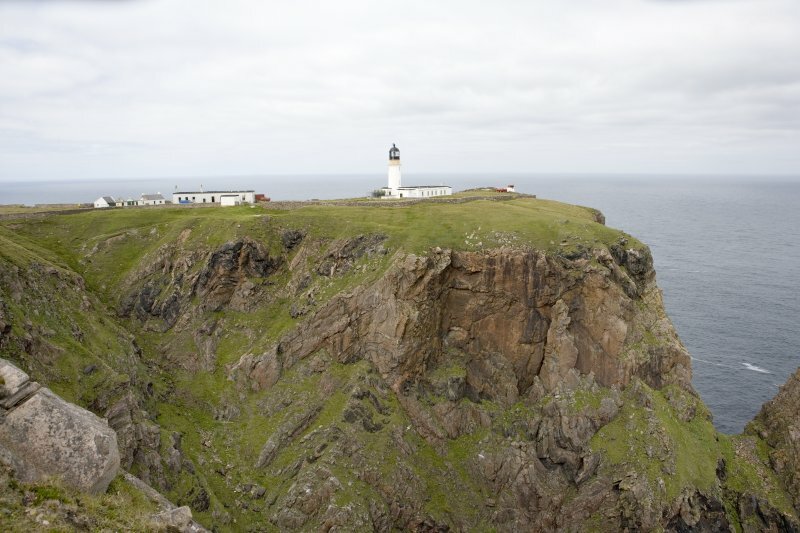 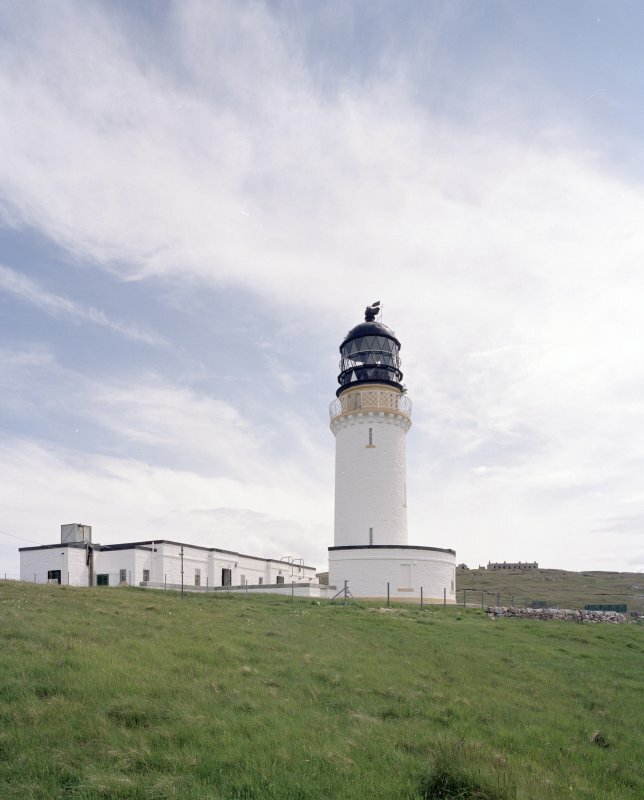 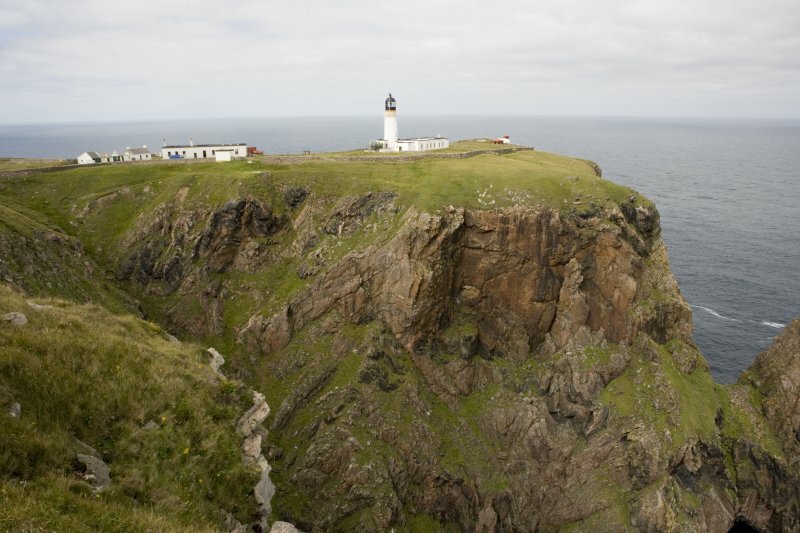 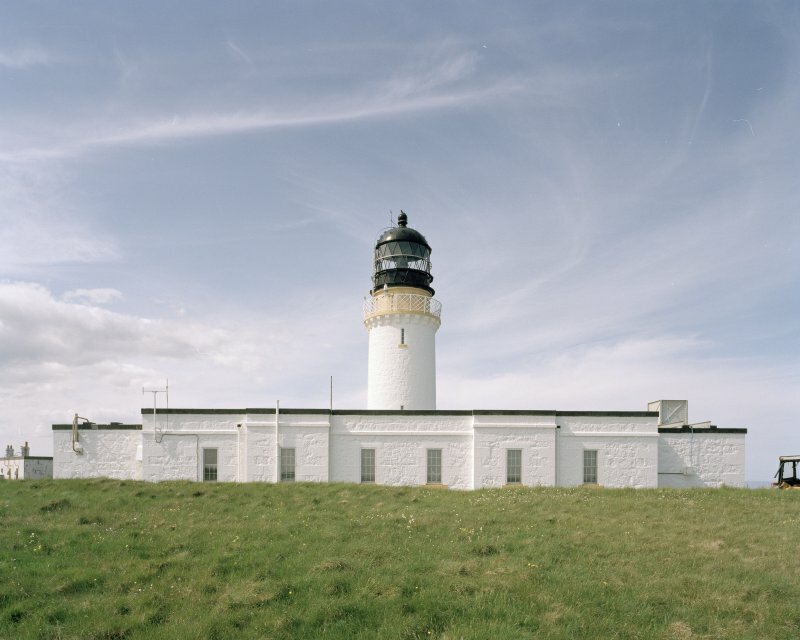 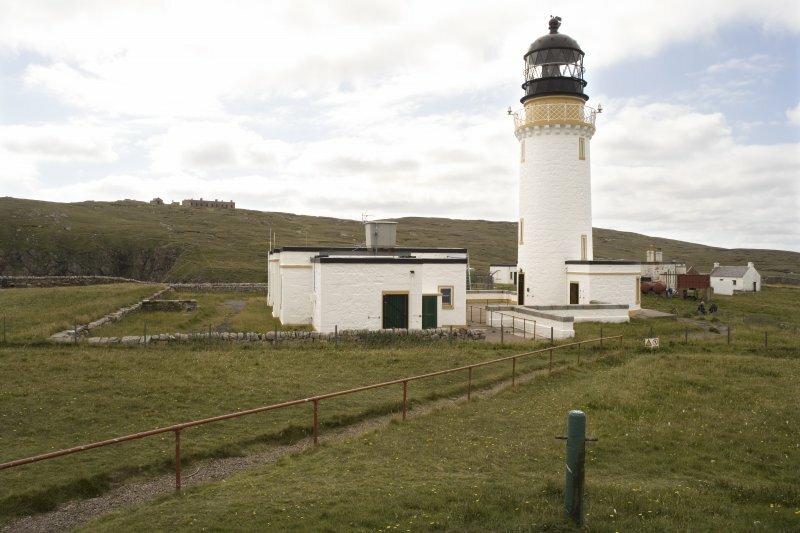 Cape Wrath lighthouse was built in 1828 and was manned up until March 2000. 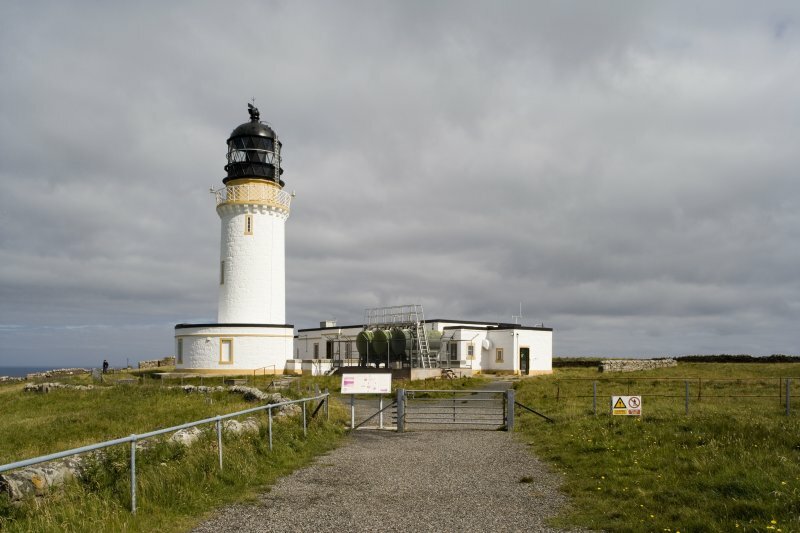 The lighthouse is still in use and is in very good condition. 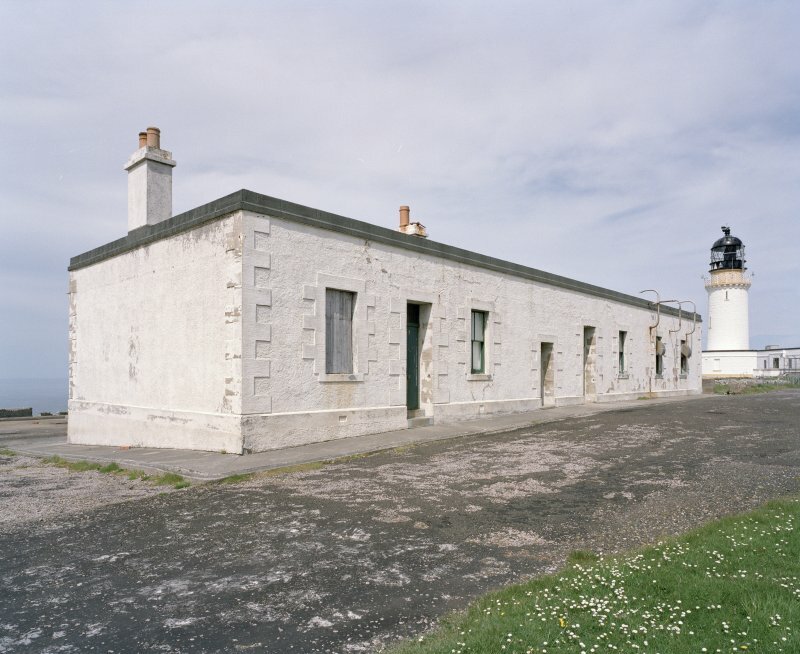 The lighthouse is depicted on the 1st edition of the OS 6-inch map (Sutherland, 1874, sheet I), and the Object Name Book (ONB) describes it as 'This name applies to a house erected by the Commissioners for Northern Lights in the year 1825. 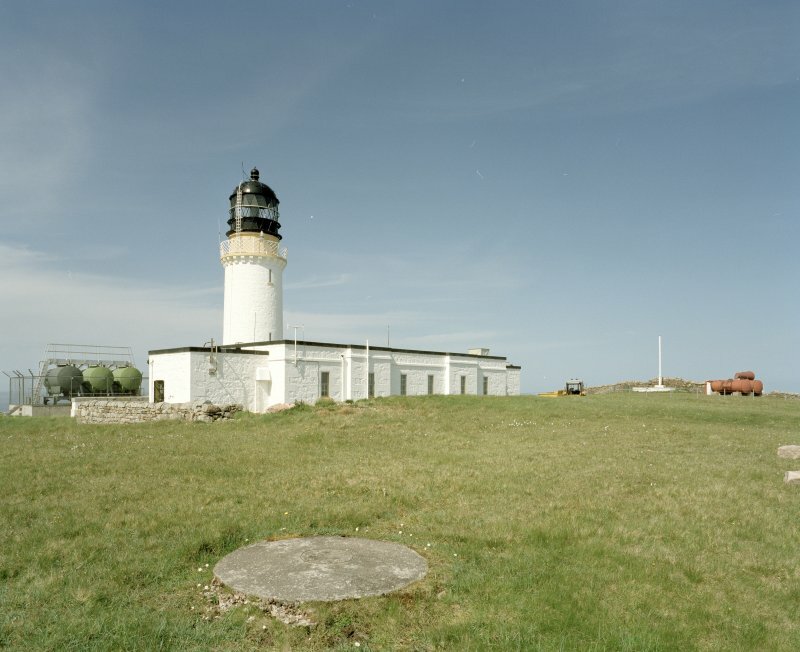 The tower, or light house proper, is of a circular shape and about 50 feet high and has 24 lights, 12 white and 12 red revolving every minute. 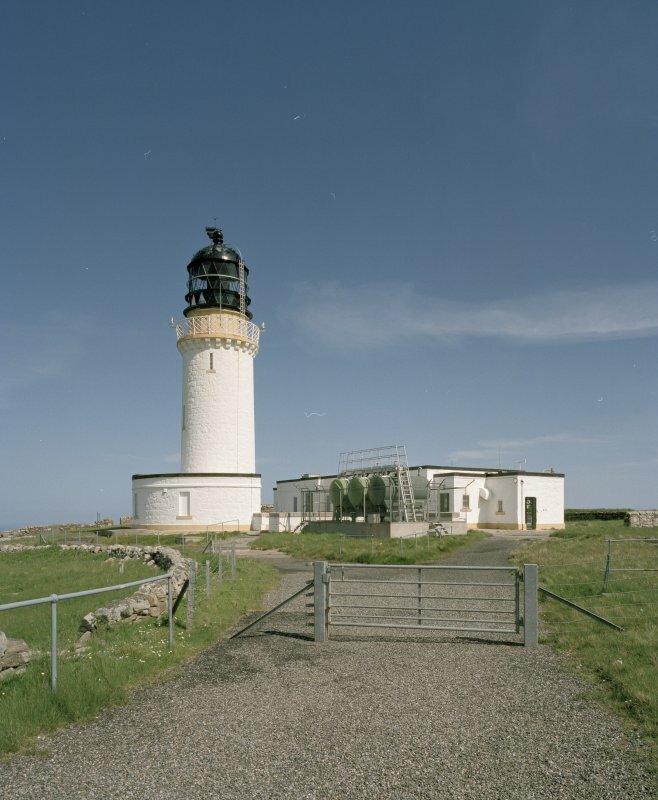 The house adjoining is occupied by the light keepers and stands at an elevation of three hundred feet above sea level. The property of the Commissioners of North Lights (Name Book 1874)'. 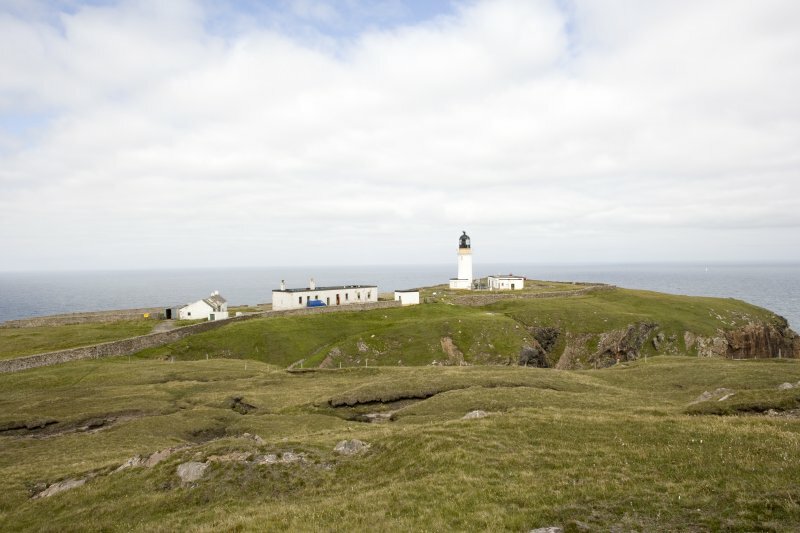 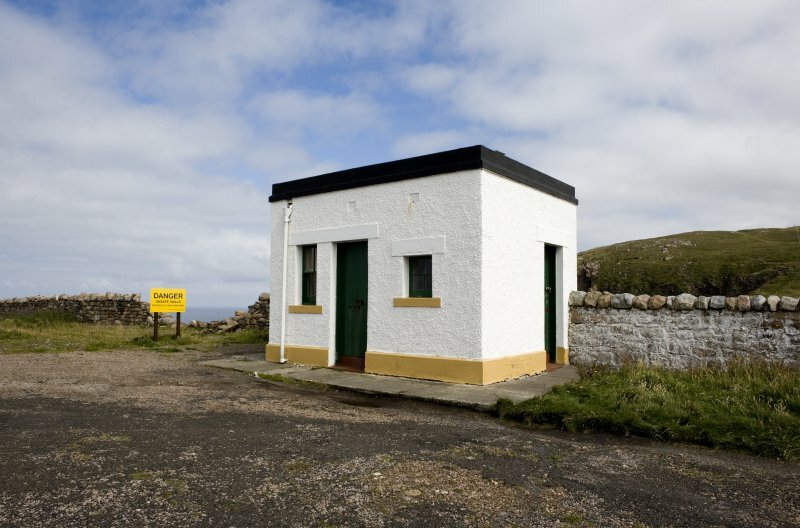 In addition the Object Name Book describes Cape Wrath: 'This name applies to the most north westerly point of land in Scotland. 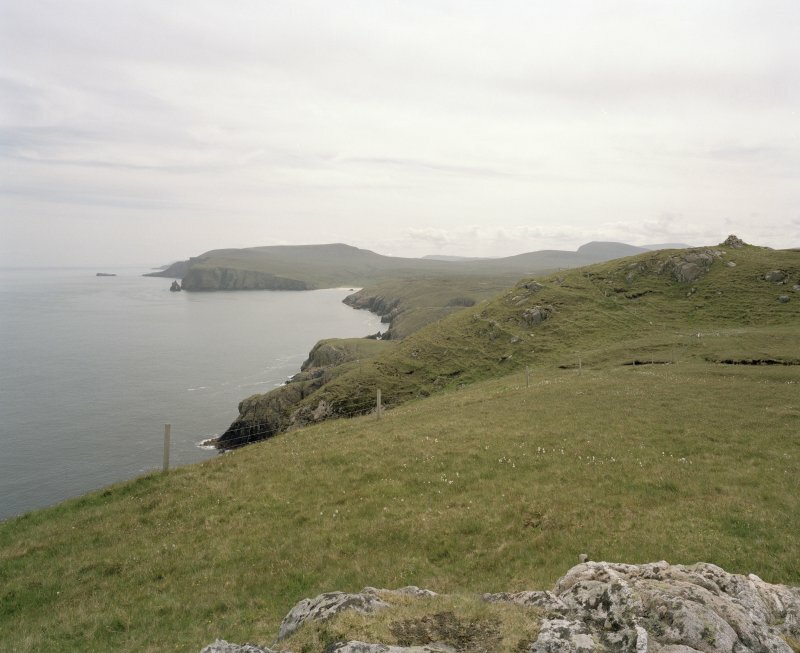 The coast at this point, and for several miles to the east and west is bold and rocky. 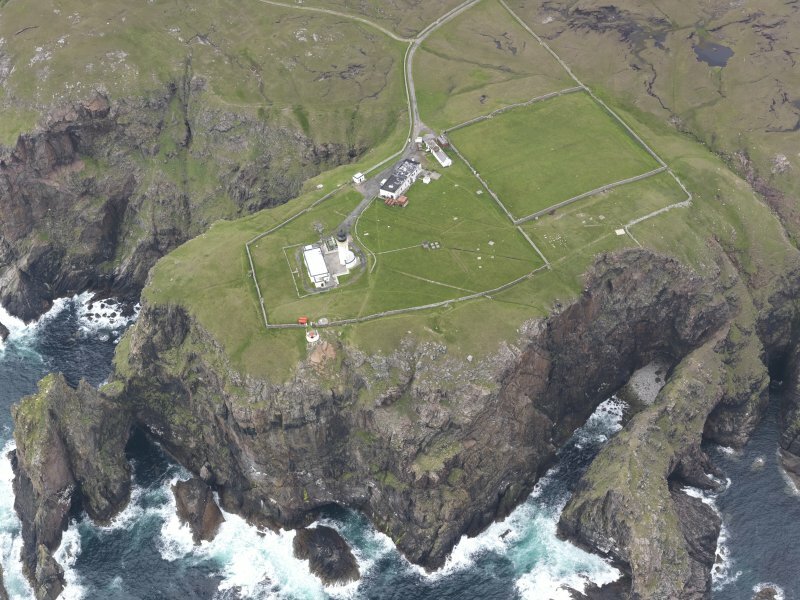 The cliffs rising perpendicular at some places to a height of about four hundred feet. 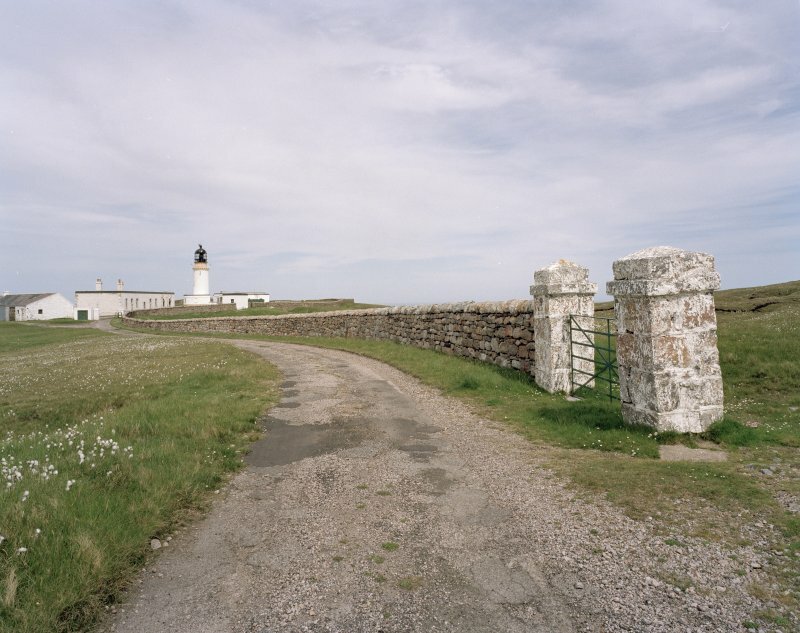 Previous to the erection of the lighthouse in the year 1825, on this headland mariners navigating these seas and who did not know the coast well were often driven on to these rocks and dashed to pieces. 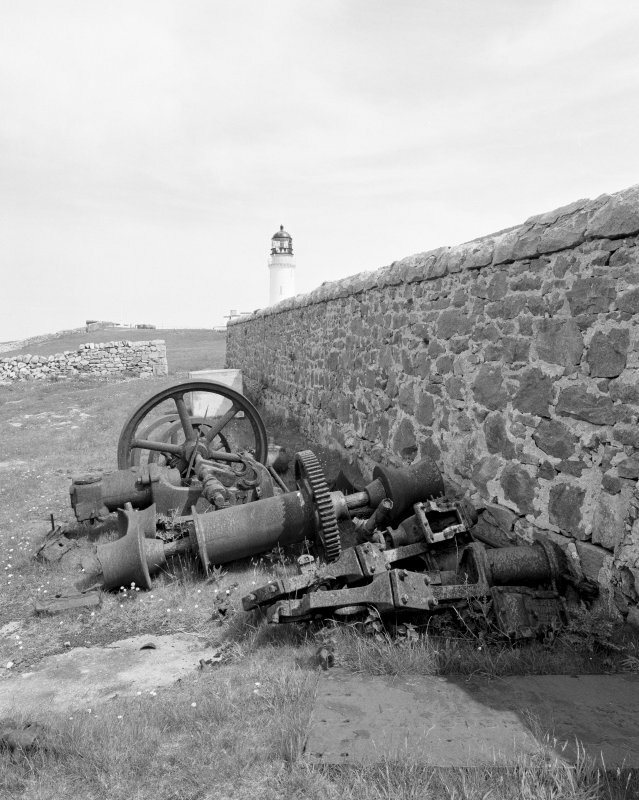 Since the erection of the light house 'wrecks' are of rare occurrance in this quarter. 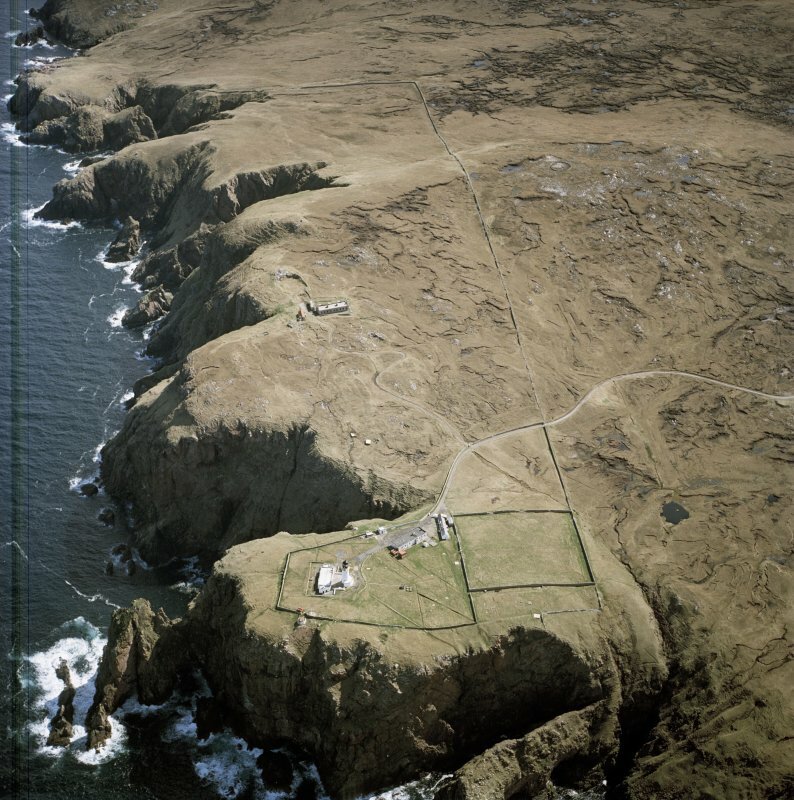 This promontory, or headland, is on his Grace the Duke of Sutherland's property (Name Book 1874)'. 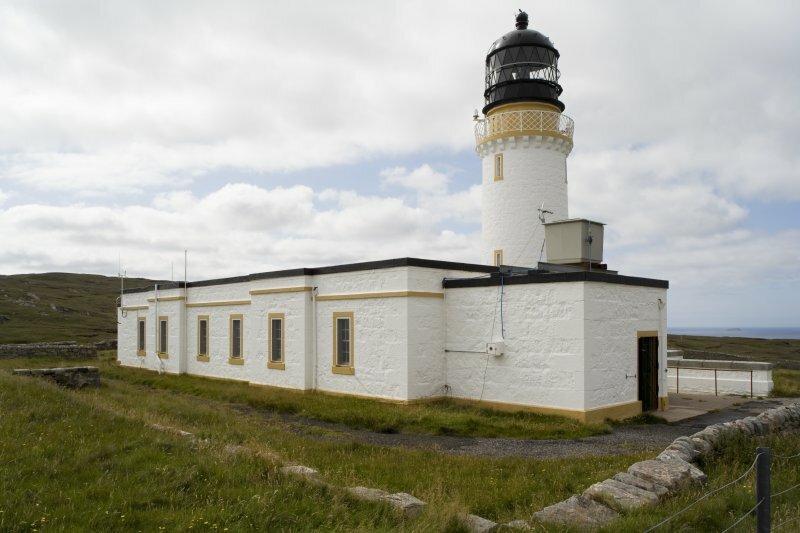 This lighthouse was built by Robert Stevenson in 1828, being one of his programme of eighteen new lights constructed between 1812 and 1833. 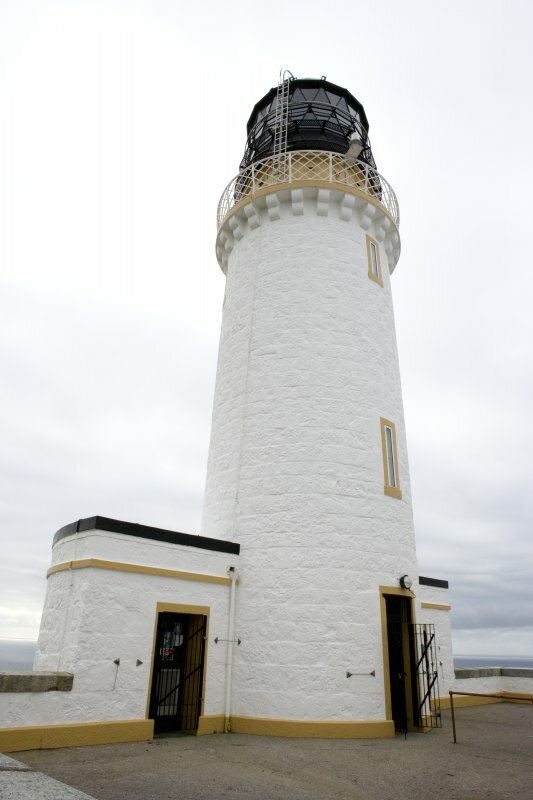 It was converted to automatic operation in 1998. 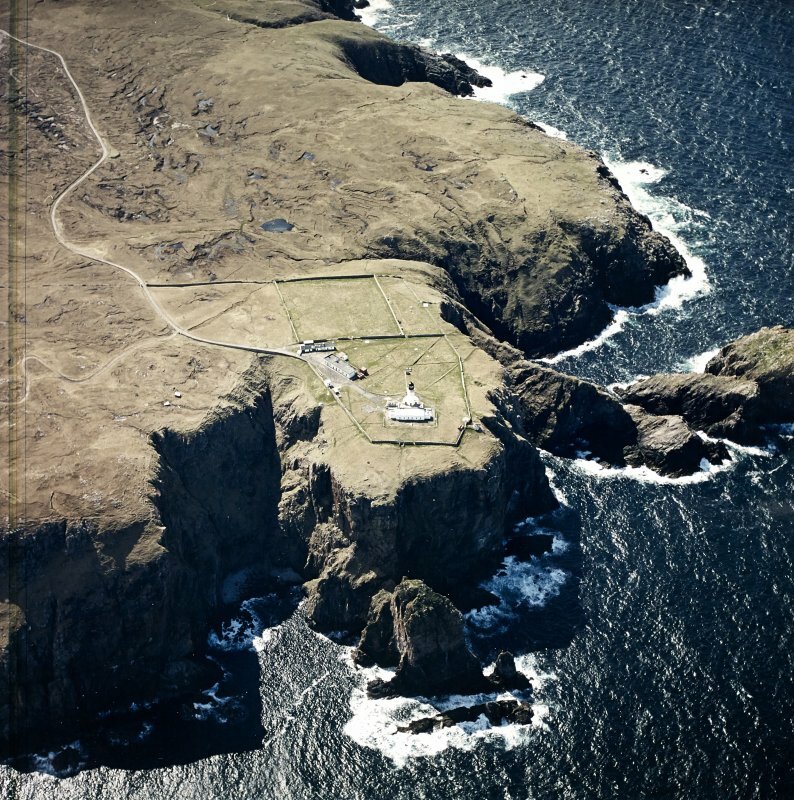 Situated on the NW point of mainland Scotland, and above high cliffs, it is distinguished by its height of 523ft (159m) above sea level. 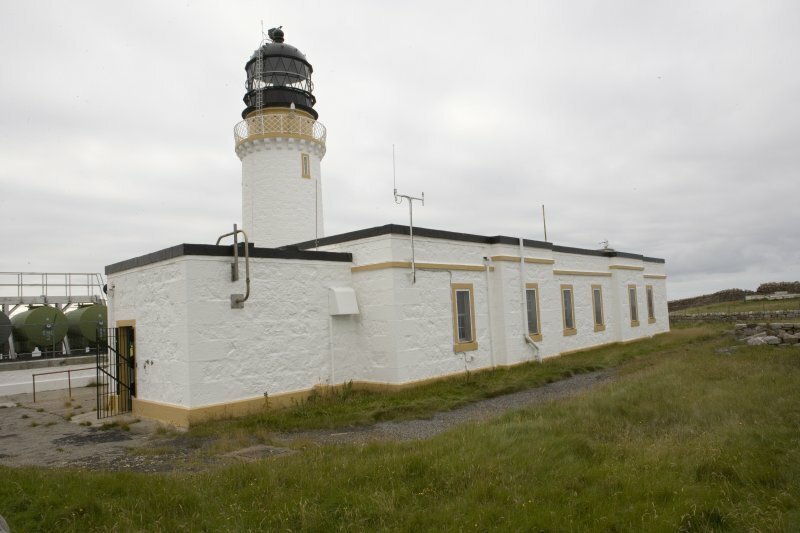 Information from RCAHMS (RJCM), 28 August 2008. 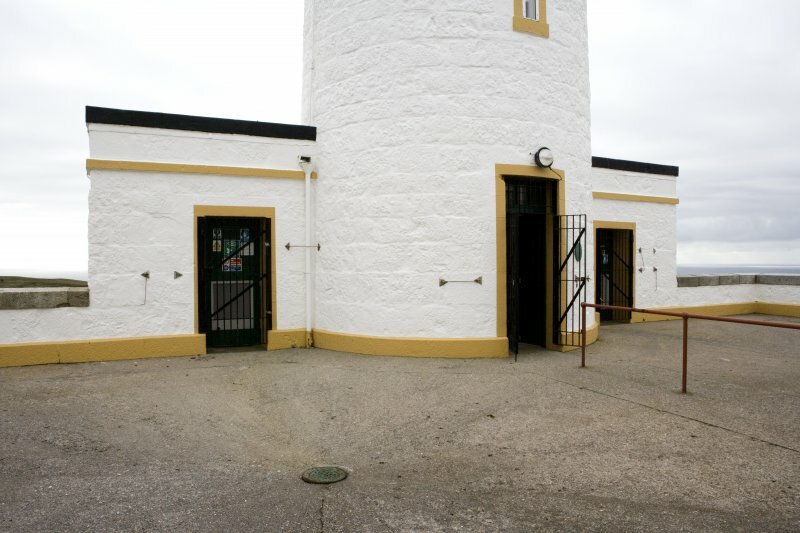 K Allardyce and E M Hood 1986; K Allardyce 1998; B Bathurst 1999; S Krauskopf 2001. 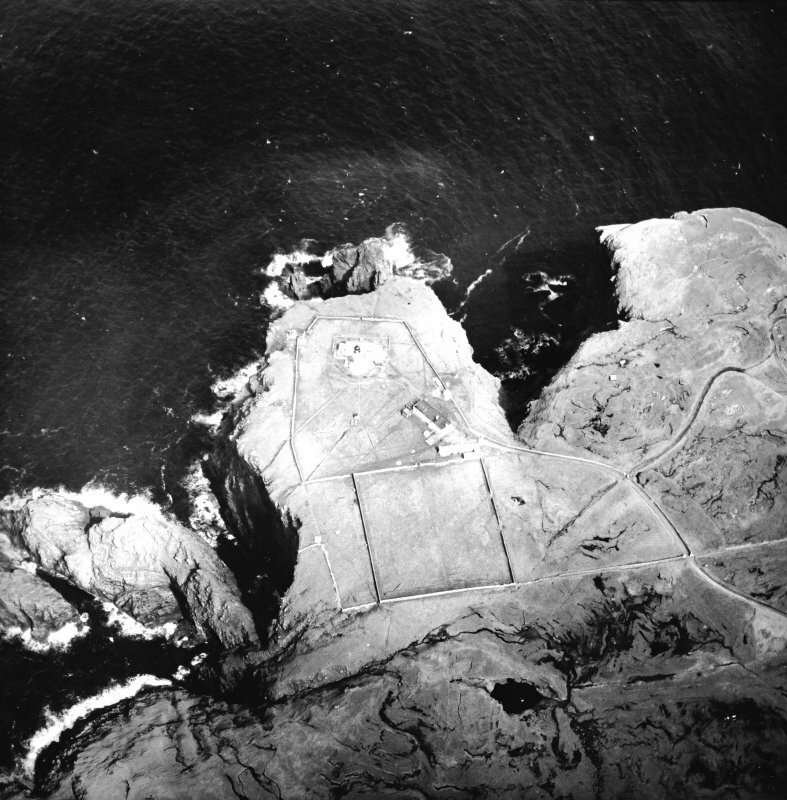 Oblique aerial photography by Cambridge University. 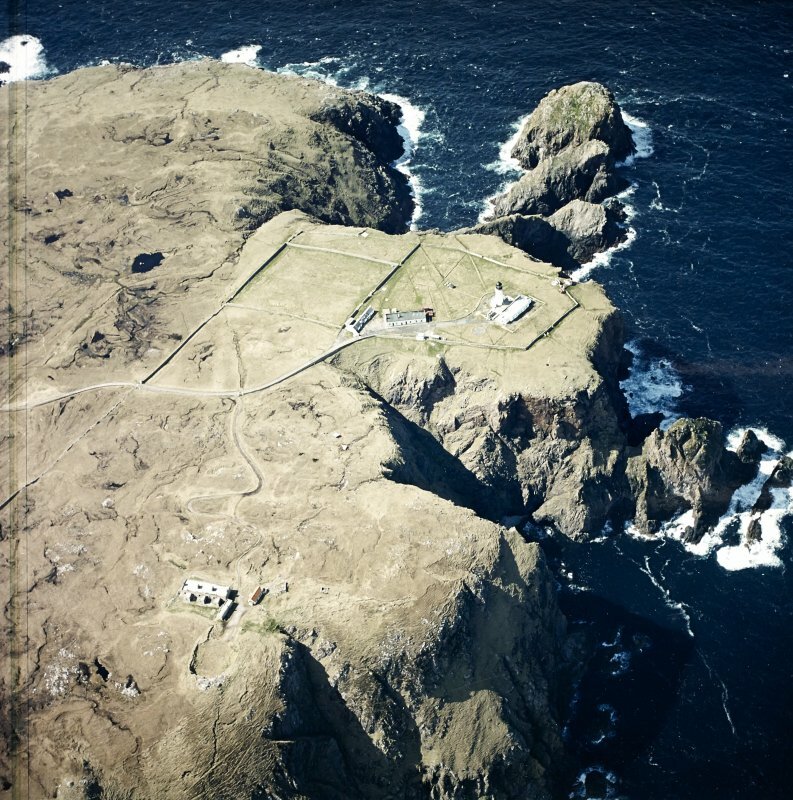 Oblique aerial photography by RCAHMS. 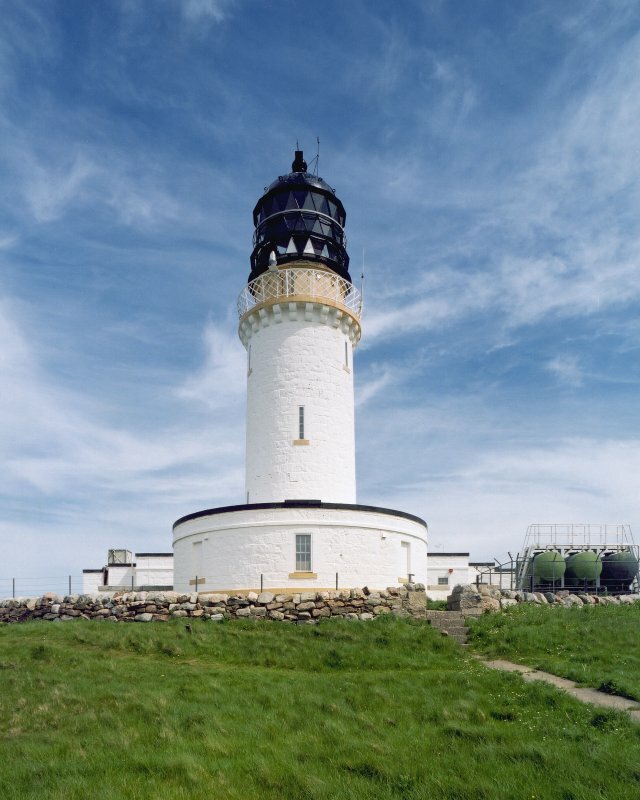 Cape Wrath Lighthouse, a 66 ft high stone tower completed in 1828 with its light 400 ft above sea level, is situated on the north-west tip of the Scottish mainland. 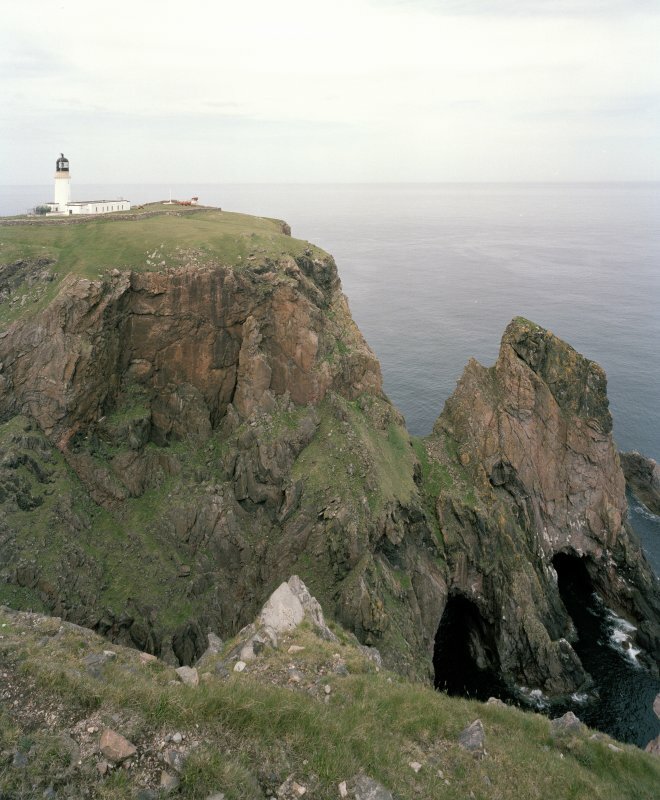 The name derives, not as one might conclude from the angry waters of the area, but from the Norse word for ‘turning point’, for it was at this point that the Norsemen are said to have turned their galleys to the north-east to head for home. 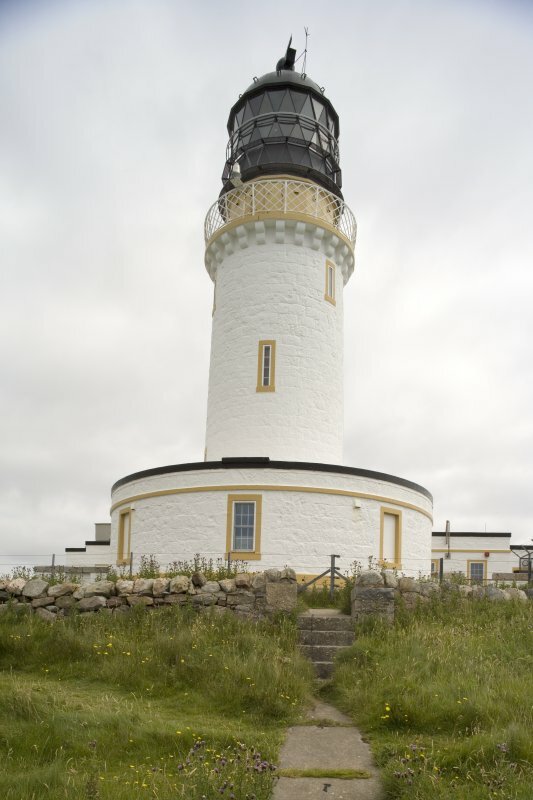 The engineer was Robert Stevenson and the contractors, John and Alexander Gibb of Aberdeen. 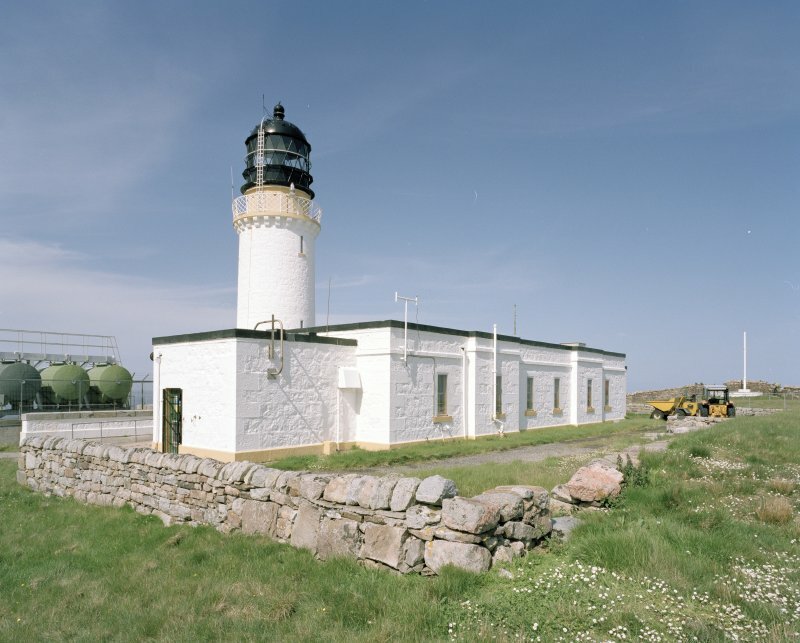 A small quay and store was built at a tidal inlet about a mile east of the lighthouse, connecting by a new road with the lighthouse, which served for bringing in by sea the building materials and equipment and afterwards for servicing the station. 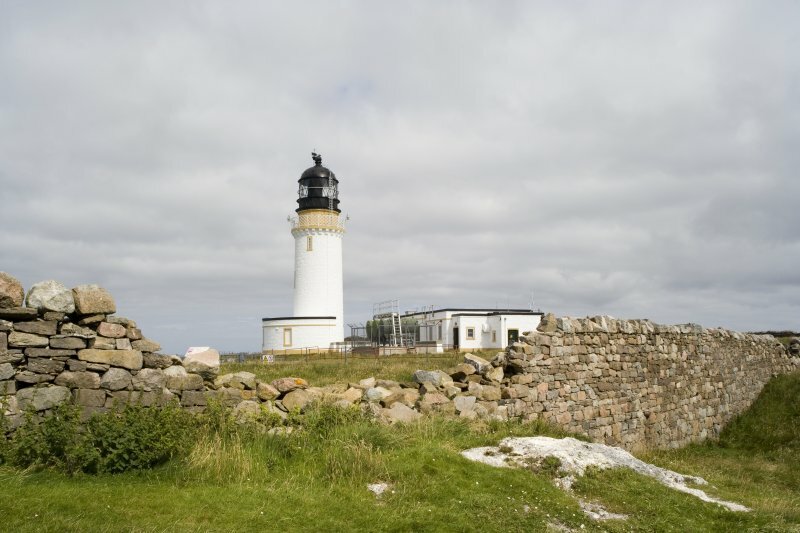 The light of 204 000 candlepower flashes at 30 second intervals and has a range of about 24 miles. 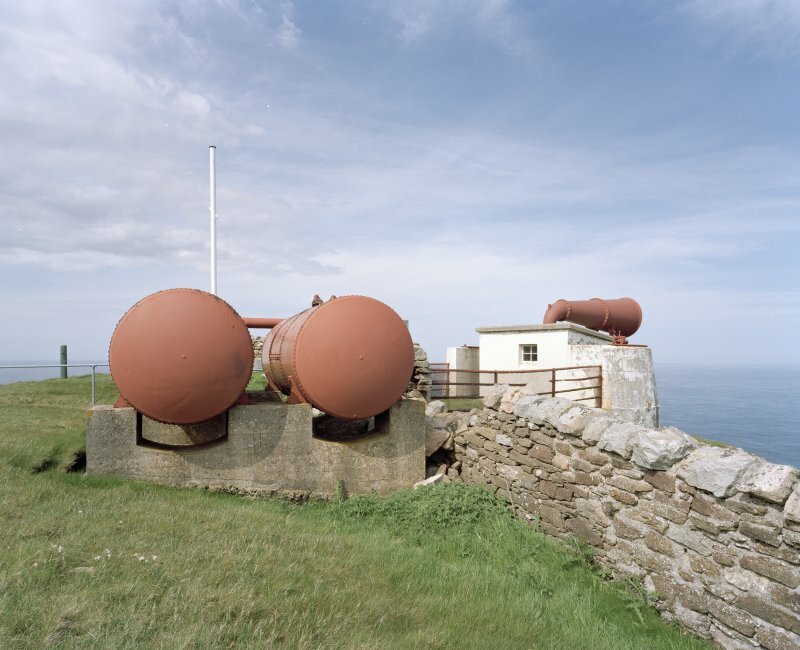 The station includes a compressed air foghorn, now disused, and a Thomas Stevenson thermometer screen. 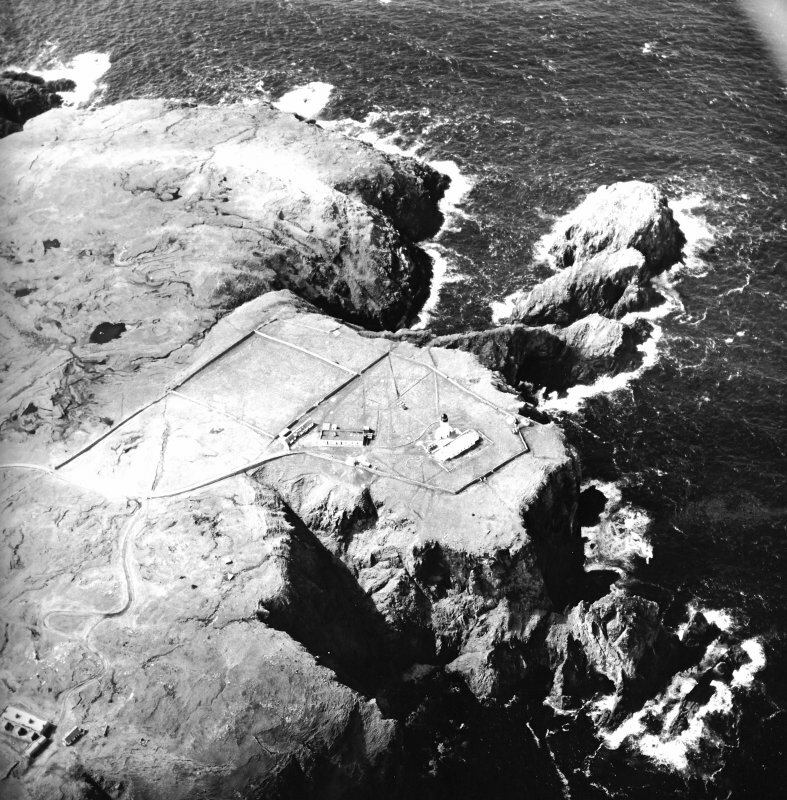 helicopter on 17 January 1977. 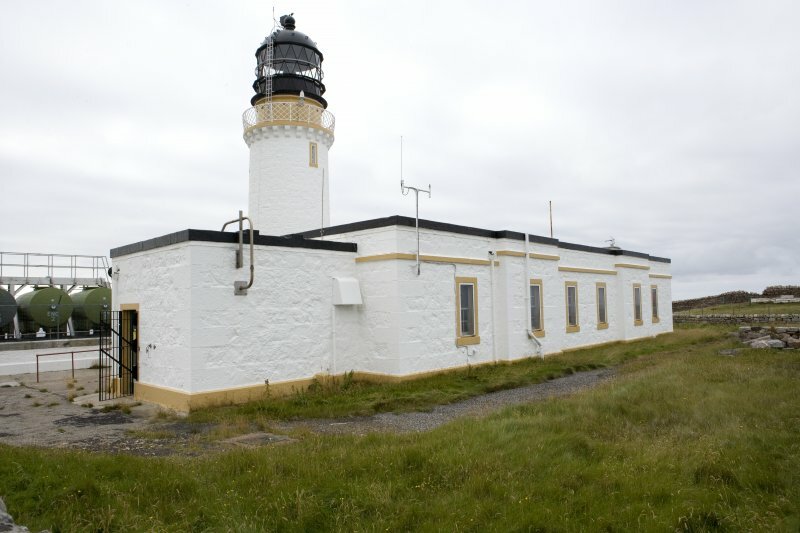 This became the regular practice until the lighthouse became unmanned. 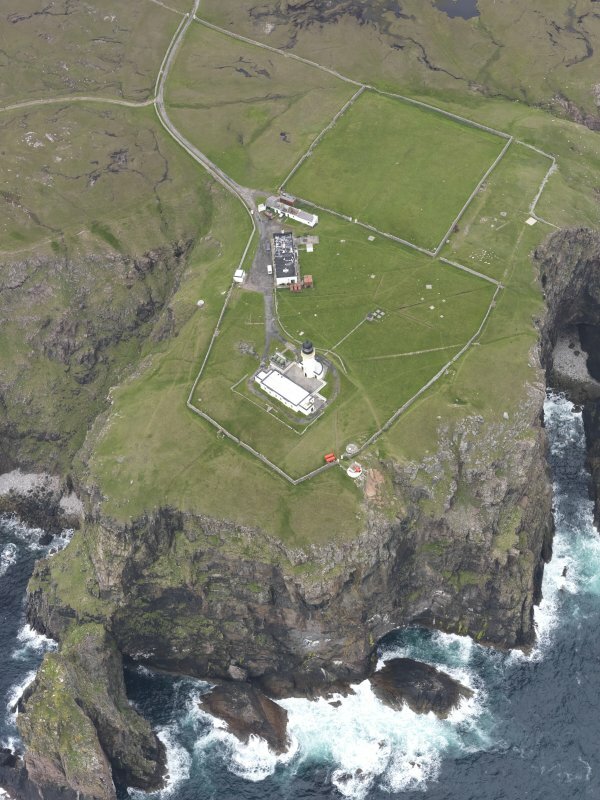 Digital images (photographs) taken during the course of the RCAHMS survey of the Cape Wrath Training Centre (CWTC) in August 2008, but featuring archaeological sites and buildings lying outwith the survey area. 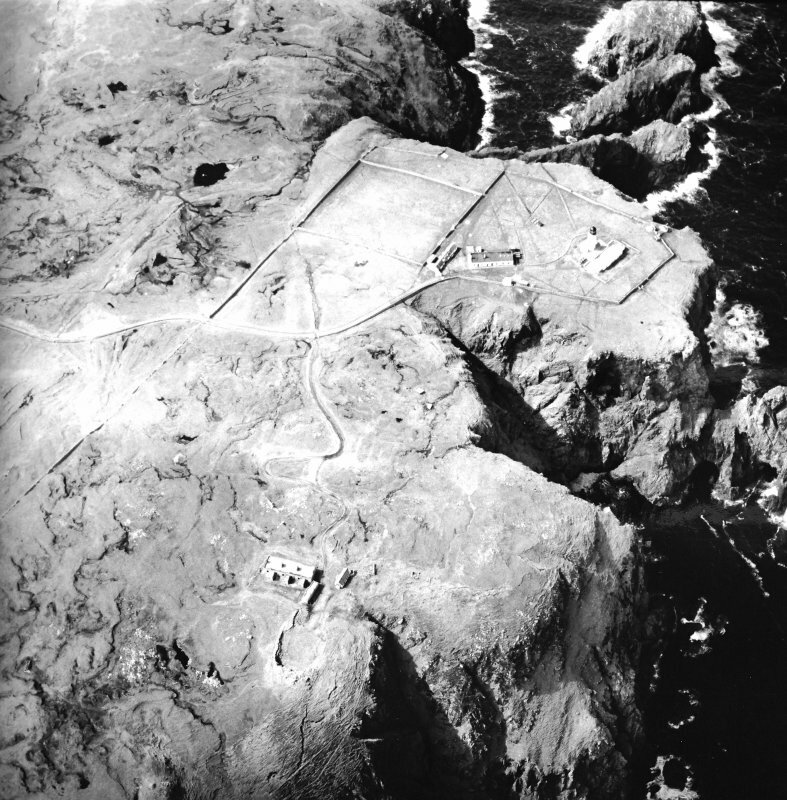 Description of site derived from oblique aerial photographs.